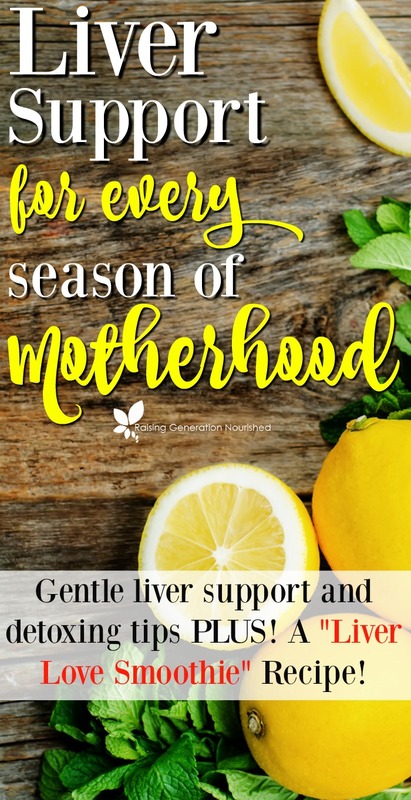 Liver Support For Every Season Of Motherhood :: Gentle Liver Support & Detox Tips PLUS! A “Liver Love Smoothie” Recipe! 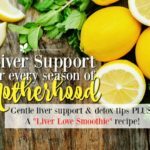 Gentle liver support and detox tips for every season of motherhood, plus a liver love smoothie recipe! Get baby to sleep in that sling, get a stack of coloring books out for your toddler, and send the big kids off to play, and settle in so we can talk about taking care of you for a bit! I’ve never been enthusiastic about housekeeping, and while I do a form of spring cleaning on the house each year (as much as can be done with little whirlwinds running around the house! ), I’m going to be talking about spring cleaning…you! Momma, did you know that it is ok to focus on your health? In fact, it is vital to your kids to have a momma that feels her best and is functioning at her best! Gentle is the name of the game…and the most effective. So here’s the deal. I’m a go-getter. I’m a jump in with both feet kind of a person. I decide I’m going to do something and I’m full on, 100 percent into it…and then some. However, when it comes to our liver, brute force, full on, over doing it is not always wise, especially if you have never done anything to help support or detox your liver before. I am putting this all in bold at the beginning of this post because I have over done before. And it is not pretty. And it actually is super ineffective as you flood your body with toxins you can’t handle. Do you need to work on loving your liver a little? Do you eat food? Breathe air? Drink? If you answered yes to any of those questions, then the answer is probably yes! Unfortunately there are toxins just about everywhere we go these days, and even if you are a “clean eater”, the environments that we live in are just not ideal. Our livers were designed to filter these toxins, but sometimes things get backed up. Helping the liver stay clear and doing a few things to unclog the liver will keep things flowing well. Many of these items are things you can do on a daily or weekly basis to keep your liver happy, all year long. My goal in this post is to show you the most gentle effective ways to give your body’s natural filtering process some love during all seasons of life. Detoxing can take on many forms, and depending on what stage of the game you are, you will want to find the best fit for you in the season of life that you are in. If you are planning on getting pregnant, are pregnant, or are nursing, your goal will simply be to give your liver some love and support so it can do it’s thing. 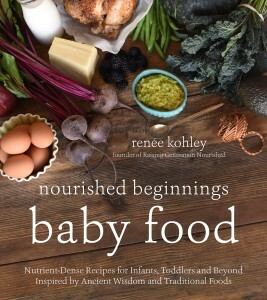 You don’t want to be dumping and detoxing while making or nourishing a baby. If you are not in a season of pregnancy or nursing, but have never given your liver a second thought before (IE you have never done any of the items on the list before), you may want to consider starting out with just a few of the first suggestions. Dumping too quickly will make you feel pretty crummy. 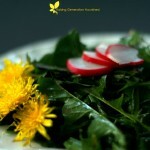 If you are a veteran dry brusher, detox bather, caster packer, and beet and dandelion lover, I’ve got some great supplements to share with you at the bottom to up your liver love game – and they truly have been a game changer for this veteran! You’ll love them! Set your thought process in the right direction. You are like the assistant making the environment prime for filtering. Dumping out loads of toxins is not the end result you want. Believe me. Assisting the unclogging of your liver and getting lymph moving should be at the forefront of your mind, and your body will do the rest for you. I promise that there are gentle things you can do to assist your body’s natural cleaning process while you keep your body environment safe, and still able to function. You can add some of these to your day today! Don’t be overwhelmed with getting every point in *right now*, however. In fact, just start with what appeals to you the most with where you are at. Some of you that maybe are already doing the first couple points are ready to move on to something more in depth. And those of you that haven’t done anything ought maybe just start with the first couple of ideas. 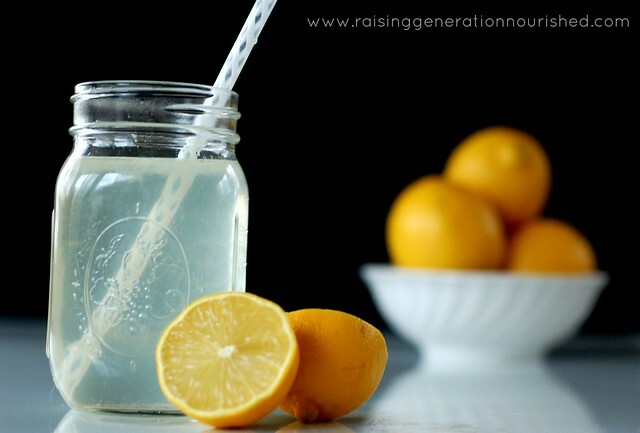 Quite simply lemon water is a great place to start. Especially if you have never done anything to aide your body in detoxing, drinking lemon water will get the party started. It will also get things moving and flushing so the other detoxing methods can work effectively. It is something you can start today, and just about everyone can afford it! From beets to greens, turmeric, garlic, and other herbs, there are every day foods you can fit into your meal plan to make detoxing a part of your everyday life. 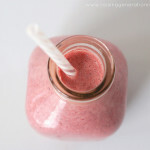 Beets blend into smoothies nicely (see the Liver Loving Smoothie at the bottom of this post! 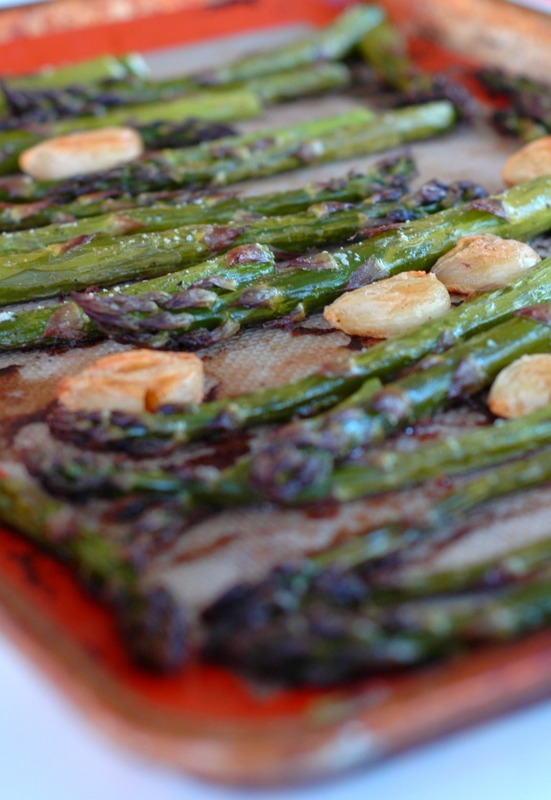 ), as well as make a great roasted veggie side for dinner. We love this beet slaw for a side salad or as a topping to a grassfed burger too! You can wilt greens into just about any stir fry and they blend up into a green smoothie without even noticing! And as far as the herbs, well…dress your food up with real food medicine! Turmeric is the main component of curry blends – you can make curry for the whole family in the form of curry soup or curry skillets and to get that in. 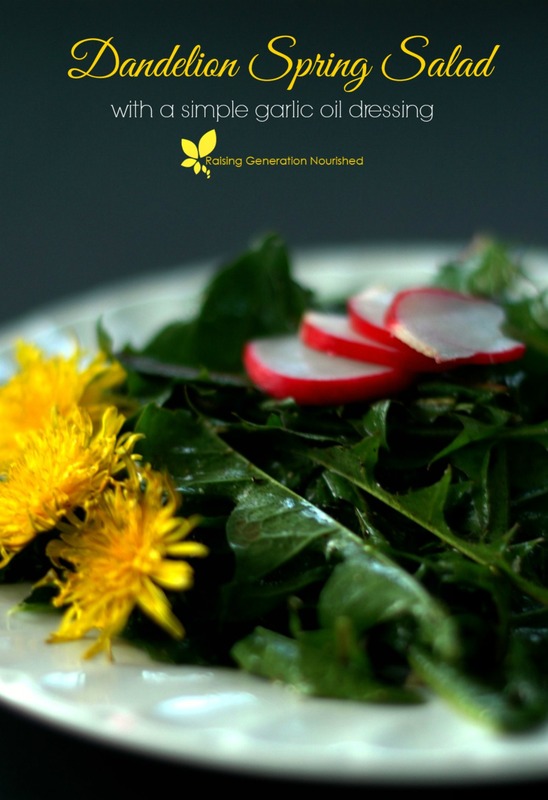 We also love collecting dandelion greens from the yard in the spring to make dandy salads. Another quick note about food and the liver! The liver cleans out around 1-2am every middle of the night. If you eat big, heavy meals at night, you might notice you wake up and feel crummy around this time of the night. Try to make the last meal of your day a healthy dinner and skip the bedtime snacking to allow your liver free space to work at night and not be so bogged down. (If you are pregnant or nursing you can snack on healthy options, but I encourage you to try eating most of your food during the day so your digestion and liver and recover at night). You can coordinate dry brushing with your detox bath which I will discuss below. Dry brushing moves lymph. Our lymphatic system carries toxins from various parts of the body to the liver to filter. Moving the lymph keeps things, well…moving! It makes your skin feel amazing too which is just an added bonus! To dry brush, simply start at your feet brushing towards the heart. Swipe each area 3-4 times moving up the legs and the groin, tummy, back, arms, armpits, and chest. Always brushing toward the heart. I like to use this brush for my body, and then I have this brush for more sensitive areas like my chest, neck, and face. This is another super affordable method to aide detoxing that just about everyone can start this week! Epsom salts have been used for ages for natural detoxification. A simple hot bath full of epsom salt draws impurities out of the body after just 20 minutes, and then after about 20-40 minutes of soaking you will absorb the mineral benefits of the epsom as well. I use 3 cups of epsom salt in my bath. You can use a cup or two of baking soda in your bath if you don’t have a water filtration system. It neutralizes the chlorine and helps the minerals in the epsom salt to absorb. This is the simplest, bare minimum detox bath, and it is very effective. If you want, you can occasionally add clay or Himalayan salt to your bath to up the ante. I like to add a few drops of lavender essential oil, and I make an herbal tea bath once and a while to make things even more relaxing. Just steep a strong pot of chamomile tea and pour it into your bath. It is very soothing! I buy large bags of epsom salt and baking soda at Costco. Castor oil packs are another very simple, cost effective way to draw toxins out of the liver or digestive system. I am 3 years out from a very looong season of being either pregnant or post partum or trying to get pregnant, so castor oil packs are newer to me in the last 2 years. I used to hate doing them because it meant I needed to lay down (ha!) and I just didn’t have time for that…or did I?! You know that 30-60 minutes before you go to bed or are laying in bed looking at your phone (yeah yeah yeah, I know we aren’t supposed to do that, but we pretty much all do it anyway!)? THAT dear momma is the perfect time to castor pack! To make a castor oil pack, you will need caster oil, a thin cotton cloth (use an old cotton cloth, piece of flannel, piece of an old tee shirt, or you can buy castor oil flannel here. ), and a heat source such as a hot water bottle. Place the cloth in a quart jar and pour about a tablespoon or so of castor oil over the cloth and let it soak in completely. Keep adding the oil until the cloth has absorbed it all but it is not dripping wet. Lay down with your feet elevated slightly and place the cloth directly over the area abdomen you are looking to help. If you are not moving your bowels well, I would recommend starting there so you can get things moving – you don’t want to be backed up while you are detoxing. Place your heat source over the cloth and rest for about an hour if you can. If you don’t want oil to get on your heating pad, put a layer of plastic wrap over it. When you are done, put the oiled cloth back in the jar, put the lid on, and keep it in the fridge for up to a month to re-use. You can then wash it and reapply the oil. Make sure to drink/stay hydrated while using a castor oil pack to keep things moving. I try to aim for 3 times per week when I am focusing on detoxing because that is what I can fit in – if you can fit it in daily that is fine! Uncomfortable side effects from castor packs are rare – only really good deep sleep and relaxation! It is truly a gentle way to detox. BIG BOLD notes for mommas who are planning on getting pregnant, are pregnant, or who are nursing! 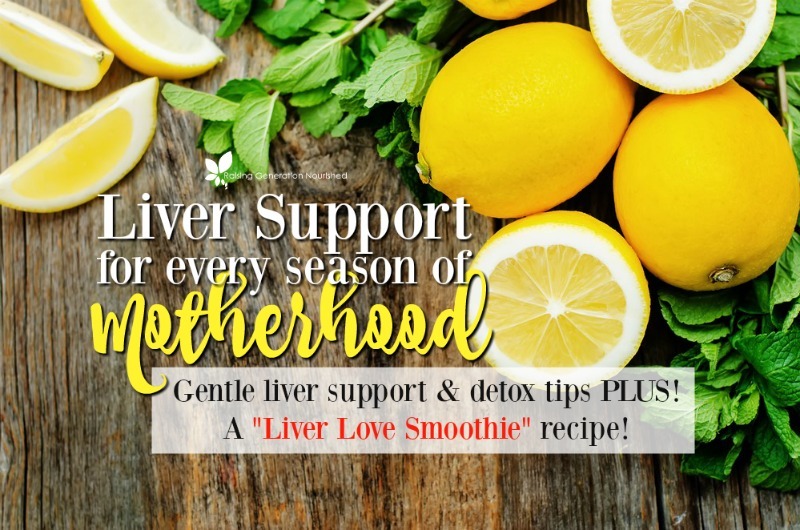 Repeat after me…“My liver focus is supporting my liver so it can do it’s thang!” You do not want to be dumping toxins while making or nourishing a baby. Focus on the supportive things above. Milk thistle is a liver supporting herb, and I loved sipping on milk thistle tea while nursing – or make milk thistle tea and use that as your base for the Liver Love Smoothie below if you don’t like tea. This is a great Milk Thistle Tincture you can add very easily to your day as well. I big puffy hear love this post my friend Kristen wrote about detoxing while pregnant or nursing. Ok! Onto my friends who are not in a season of pregnancy or nursing! There are so many herbal supplements on the market to try out for loving on your liver. Some of them use herbs or herbal blends that are more supportive in nature, while others are focused on actual detoxing and removing toxins. Over the years I have tried numerous liver loving herbs. I like making dandelion root tinctures because they are easy. And adding milk thistle to tea is great too. I have used a handful of herbal liver detox supplements on the market, and I am quite impressed with the Liver Detox supplement from Perfect Supplements. (If you decide to give the PS Liver Detox a try, be sure to use your RGN reader code for 10% off! Just put GENERATION10 in the coupon spot at checkout!) I have been using the Perfect Supplements Liver Detox for the last month! The Perfect Supplements Liver Detox is naturopathic doctor designed and endorsed. It is SO easy to take, and lets just be honest…sometimes I don’t make the time to brew tea! It is the perfect blend ratios of milk thistle, turmeric, and artichoke as well as schisandra berry, broccoli sprout powder, cilantro, and chlorella superfoods to enhance both phase I and II Liver detoxing. It really is an “all in one” package! I like to take liver detoxing supplements at night on an empty stomach so that by the time “liver time” comes around in the middle of the night (livers clean out around 1-2am!) they have the support they need. While everyone is certainly going to have different responses, there are a few general ideas to keep in mind as you take on unclogging the liver so you can get rid of toxins. You may not notice more than a few pimples as your body rids toxins. If you are doing something more thorough such as some of the supplements, you may feel more. Tiredness/Fogginess/Energy Decrease. It is a lot of work to detox. And the toxins can make you feel a little off. It shouldn’t last long – again if you feel really off it might be indicating that you are doing too much too soon. Back off on doseage, and start with some of the basics of unclogging your liver so it can filter better. Be gentle to your body as you start, getting enough rest/sleep so your body can work. Nausea/Digestive Upset. As the liver and gall bladder drain, it can cause nausea, and as old material in the digestion get moving, you can feel bloated. Again – if this is amplified over days, it might mean you need to back off a bit. Skin Eruptions/Rashes. Your body can get rid of toxins through the skin. A bit of acne or a skin rash may indicate some detoxing. It should be mild – if it is not and you feel like you are having a Herxheimer type reaction (I have experienced this – NOT fun! ), you may be doing too much too soon. Back off and start with some of the basics of unclogging the liver. Be sure to check this post from my friend Kristen for more possible detoxing symptoms, and a thorough explanation of healing reactions. What can I do to get over detoxing symptoms and still function as a mom? GREAT question! I think many (including myself way back when) think detox equals energy. And it just doesn’t until you get rid of the toxins. Detoxing is getting rid of the yuck so you are not going to feel fabulous until the yuck is gone. I don’t feel awful when I do these things anymore, but when I first started out it wasn’t very fun. Here are a few things I have learned that will help you over the detox hump so you can still get through your day. Take it easy. Nap, sleep, rest. Whatever you have to do. This is another reason why it is important for pregnant and nursing moms to not go full on overboard with detoxing. It is near impossible to get the amount of sleep you will need for a big detox when you are up nursing a baby or rolling all over uncomfortable in bed at 8 months pregnant. I am not ashamed to say that while I am spending a focused period of time on detoxing, I get at least 9 hours of sleep per night. It’s called discipline. And it stinks. I set an alarm for my bedtime. I let a few things go on the house so I can occasionally get a nap in. It is so worth it though. In the end you will have MORE energy! Drink more water/herbal tea/lemon water. You may feel more thirsty while you are detoxing (I usually do), but even if you don’t, drink as much as you can to flush it out. I don’t do well with plain water diluting my electrolytes, so I sip on sea salted lemon water or herbal infusions all day. It sounds simple, but I even plan ahead for this. I have an alarm set on my phone to remind me to make a gallon of herbal infusion to sit over night so I don’t forget. Plan ahead! Eat well and ditch the sugar. *ducking*. I know it. I’m sorry. But we all know sugar just doesn’t jive with a healthy lifestyle. Even “real foodies” can sometimes get caught up in making real food treats, and for occasions, that is totally fine. But sugar is still sugar at the end of the day, and it inflames the body when we get too much of it. Period. So you can do all the liver cleansing techniques you want, but if don’t eat well, you are just putting it all right back in. You don’t need to be 100% perfect in my opinion, but if you want to feel well, I do think the food we eat plays a roll. Don’t over do the exercise. Again, it is a lot of work to detox. Gentle walking, stretching, and yoga are great for getting lymph to move without taxing your body. Rebounding is probably one of the best exercises during detoxing as it is a great way to move lymph and get the yuck out. Make sure your bowels are moving. It goes without saying that your bowels are moving waste out! You don’t want to be backed up while unclogging your liver. Add some chia seed to your smoothies (see the Liver Love Smoothie below! ), drink plenty of water, make half of your plate veggies, take a good probiotic (you can see the probiotics I take in the supplement section of this post), and keep the sugar low. As promised! My Liver Love Smoothie Recipe! This is safe for every momma, no matter your season of momma-hood! Just watch the notes on the Aquatic Greens for my pregnant and nursing momma readers! This liver love smoothie is refreshing and energizing! Happy liver loving to you dear friends! 2-4 TB steamed peeled beets or greens like kale or spinach freeze a load of them so it's easy to grab! 1 scoop grassfed collagen this adds 10g of taste free protein! 1 TB chia seed to keep your bowels happy! Everything into a high powered blender to blend until smooth. Tastes the best if the liquid base is cold and the oranges are frozen. You can freeze a load of orange slices and steamed beets and keep them in a freezer bag in the freezer for convenience. You can also steam huge boxes of baby spinach or kale and freeze them into "pucks" in a muffin tin and then into a freezer bag. 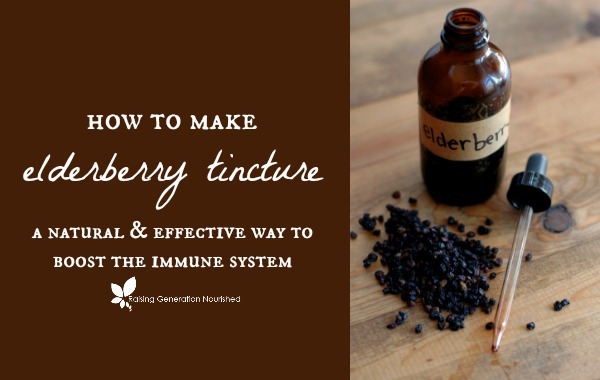 Learn how to make and use an elderberry tincture to effectively battle viruses and boost the immune system! Preface: I am not a medical doctor. Use your own discretion, momma gut instinct, and research to make a decision if the natural remedies discussed in this post are for you. Obviously if you or your child is not responding to natural remedies well, or symptoms become worse, seek medical attention. Product links in this post are affiliate links. It does not cost you anything and helps maintain the free information on this site, as well as answer the questions of “what brand do you use?” Please know I never personally recommend any product I wouldn’t use on my own family. I will never forget the year I was sold on using elderberries during the fall and winter seasons. It was my oldest’s first year of preschool. She was 3 1/2. And my goodness the little germy bugs that float around preschool rooms are enough to make your skin crawl! I had used elderberry syrup on and off up until then, but with our new found school schedule, and accompanying germ-fest, I came to heavily rely on the virus fighting capabilities that elderberries brought. Every week or so there were emails home about croup bugs, hand foot and mouth viruses, flu, strep, and on and on and on…. We rode out that first year of school with just a couple minor colds, and I was sold. Yes there is a whole lot more to kids staying healthy during the school year than just elderberry syrup. But with as young as my first born was, and as unexposed as she had been (no daycare as a baby), it is pretty amazing she came out of that year with just a couple colds! Elderberries have been known for centuries for their immune boosting abilities, and have been shown in studies to enhance immune system function for defending and fighting against disease. Elderberries boost the production of cytokines, which are the body’s “messengers” for immune system defense. 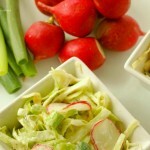 They are also filled with antioxidants for reducing inflammation in the body from being sick or under attack. 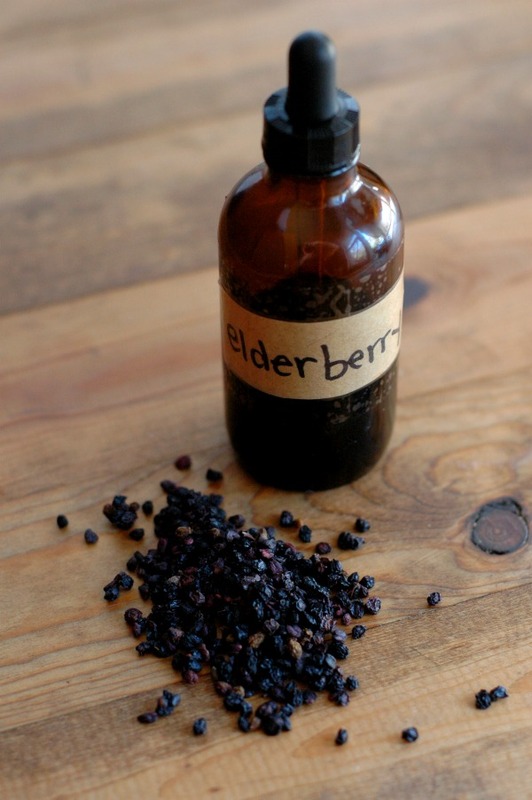 While we love our elderberry syrup, making an elderberry tincture just plain saves this busy momma time! A tincture is simply a liquid extract of whatever herb you are looking to use. The herb components are extracted into alcohol or vegetable glycerine. Because it is so concentrated, the dosages are smaller, and you won’t be in the kitchen simmering elderberry syrup every 2 weeks to keep up with a houseful of school aged children! 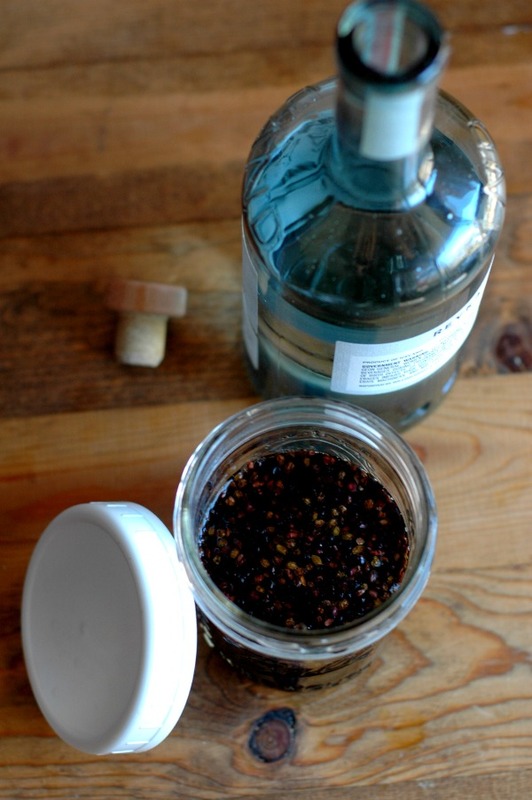 Extend the shelf life of your elderberries! Elderberry syrup lasts in the fridge about 2-3 months. Tinctures last up to 5 years. If you get to the end of the cold and flu season and find yourself with elderberries left, it is best to tincture them up to maintain their potency. I have found a 9 month old half-used bag of elderberries I forgot in the back of my cupboard only to open them up and find them moldy. Tincturing takes the guess work out of shelf life. This is the best part! Brace yourselves…this is too easy! That’s it! 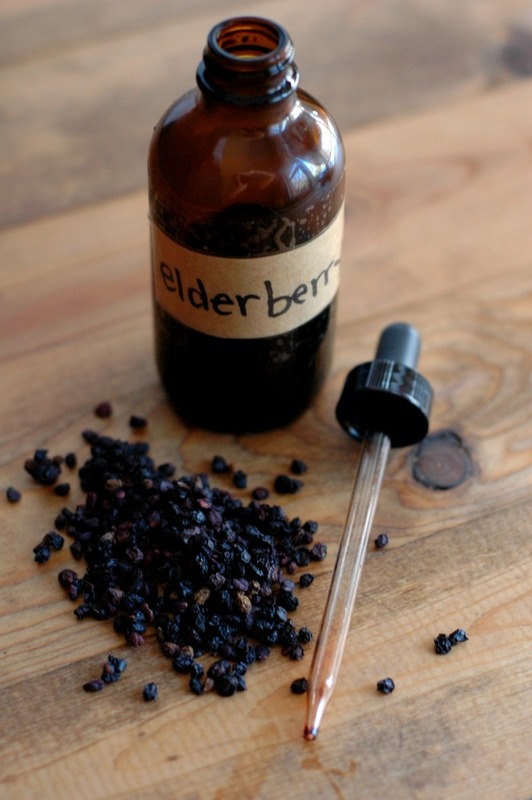 And in less than 2 minutes you will be on your way to your own elderberry tincture! 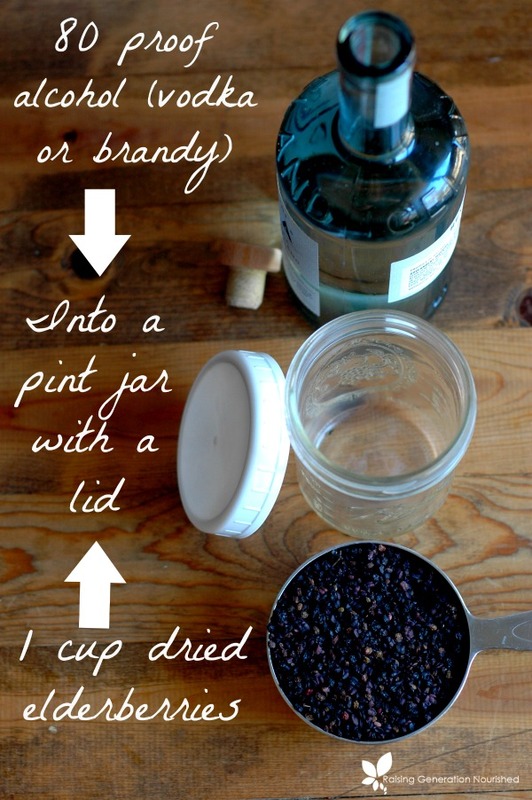 Fill your jar with about 1 cup of dried elderberries, cover the elderberries with the alcohol, and put the lid on. So how do I dose my elderberry tincture out of my 4oz bottle? Tinctures can taste strong. 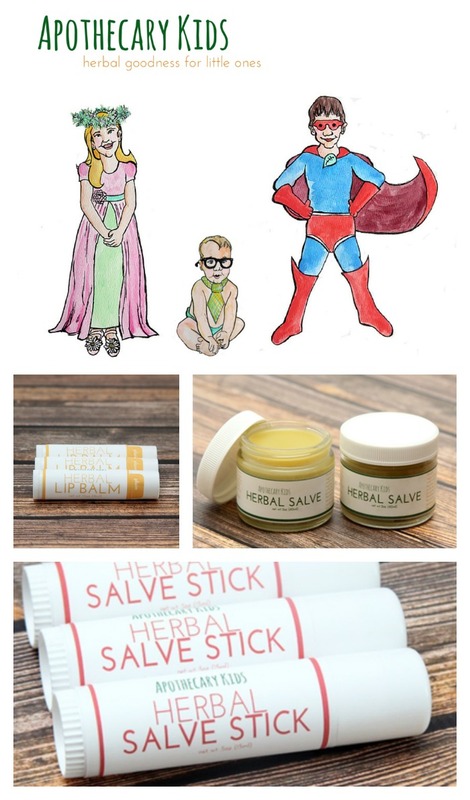 I have found that my kids don’t bat an eye at them because they have been taking tinctures for various reasons since infanthood (such as teething tinctures and calming tinctures), and they are just used to them. Below are some things to keep in mind. Tinctures work best held under the tongue for about 30 seconds. Obviously young children do not do this, but as my girls have gotten older we make it a game by humming the ABC’s or Twinkle Twinkle Little Star while we hold it. You can dilute the tincture a little to tame the alcohol too. You can mix the tincture with a spoonful of raw honey, yogurt, or applesauce if you think the kids will take it better that way. You can dilute the tincture in a warm cup of water with raw honey to make a “tea”. While herbs work best on an empty tummy, just get it in when you can! I do shoot for in between meals, but in a houseful of busy kids that just doesn’t always happen. 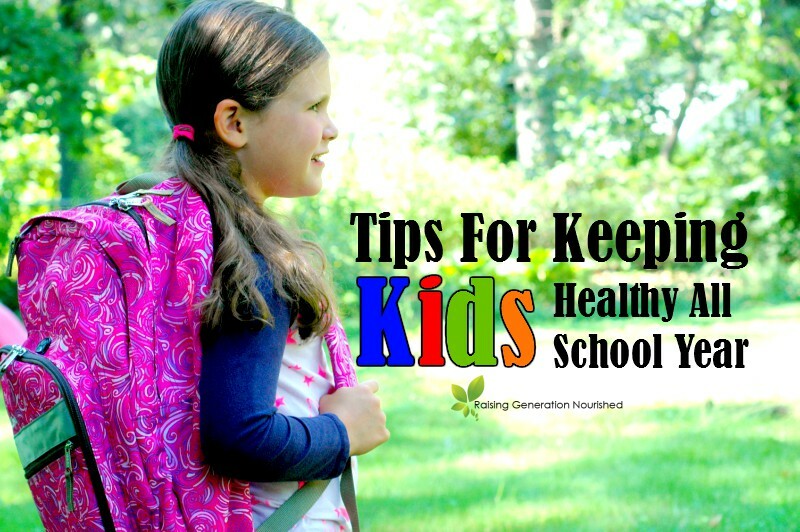 Simple, natural tips for keeping kids healthy and giving them the advantage in fighting the every day school germs! Escape the back to school bugs! I admit, it creeps in the back of my head as well. Within those first few weeks of school the emails start rolling out warnings of this bug and that being passed around the classroom, and it’s enough to make you want to send your kid to school in a bubble! Of course our kids do not live in bubbles, and in fact, an occasional cold bug is a great thing to let their bodies “clean house” and build immunity. There are definitely some things we can do however, to give our kids the “upper hand.” We can help their bodies fight off bugs more efficiently so that the bugs either don’t even show up as a full on cold, or so that they don’t last as long. Here are our household secrets in keeping our houseful of kiddos healthy *all* school year long! First and foremost, it is important to remember that school aged kids are kids. Not adults. School days are long at every school age. In addition to school schedule, packing in a bunch of extra activities at the end of the day can really drain their bodies. If activities after school are a “must”, then it really ought to be made up for on the weekend with naps and early bedtimes. Period. Growing kids need downtime and play to recoup. Taxed adrenals from lack of sleep and stimulating days don’t allow the immune system to do its job effectively. Plan in what is absolutely necessary, and literally schedule in bedtimes and playtime if after school activities are a part of their week. Back to school bugs are pretty much a given to be passed around within the first few weeks of school. We have escaped the throws of those first few weeks of the back to school cold being passed around by boosting our systems a good month before school starts and continuing through the fall. Get the kids outside for fresh air after school and open the windows at home to air everything out! YES in the middle of winter too! The kids breathe stale, inside shared air all day at school and need to play outside and breathe some fresh air. You would be surprised at what even the winter sunshine can do for their demeanor and health – outside light and fresh air is important! Keep in mind that bugs are going to happen! It’s inevitable and sometimes a good thing for their body to do some housecleaning with a bug. If the illness is a recurrent thing, it’s time to stop and take a look at what might be a root cause keeping their body run down, but a few bugs in the course of a school year isn’t the end of the world. So here is our immune system booster line-up! Well sourced cod liver oil is a fantastic source of the right ratios of vitamins A and D which nourish the immune system. High doses of vitamin D by itself is not recommended as it is balanced best in the presence of vitamin A. This is why cod liver oil is a great source of getting your vitamin D during the cold, dark fall and winter months. Cod liver oil is also a good source of omega 3. Omega 3’s fight inflammation in the body from stress and stressors (like being sick!) and help the body heal. I have doubled up on cod liver oil during the first day or 2 of the onset of a cold and really felt like it helped knock the virus and inflammation out faster. You can find our favorite quality sourced cod liver oil here (Use the code GENERATION 10 checkout and get my RGN reader 10% discount!). We follow the WAPF dosage recommendations. 1/2 – 1 teaspoon 3 months old to 12 years old, and 1-2 tsp 12 years old and up. I do double up the cod liver oil for a day or 2 during illness. Vitamin C can do some pretty amazing things to aide our immune systems in fighting bugs. It reduces inflammation and boosts the fighting power of our immune system to make the bugs have a shorter duration. The sourcing on the C truly does matter, and if the back of your bottle says that the C is “ascorbic acid” as its source, you will want to take a peek at this article about why a whole food sourced C works better and is safer. My favorite source for a whole food based vitamin C is this brand . I also use THIS whole food vitamin C spray for my toddler who can’t swallow capsules yet, and I LOVE the convenience of it! My girls take 250-500mg of vitamin C every day, though keep in mind every child is different and has different needs. Start out small and be sure they are doing well on it. I do double their C during illness. By now I think everyone has heard the phrase “all disease begins in the gut,” and it couldn’t be more true. The beneficial bacteria in our guts are the immune system’s first line of defense. Probiotics keep the intestinal lining strong and secure, providing a barrier to fight against pathogen attacks. Keeping the flora in the gut balanced means having more good bacteria present than bad. 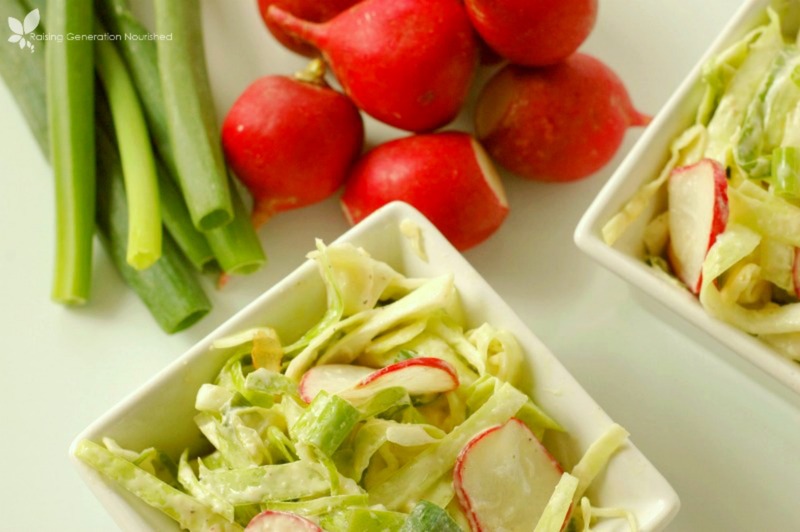 We love probiotic rich fermented foods such as sauerkraut, yogurt, kimchi, and pickles in our house. Sometimes they just aren’t at every meal we are eating, however! I have found it best to keep up on our gut flora by using quality supplements which also present our guts with different varieties of bacteria to keep everything happy. My girls take 1 dose (depending on the brand we are rotating) of probiotics every day, and I rotate the brand to give them a variety of bacteria strains. We use Just Thrive, PrescriptAssist, and Garden of Life for Kids . (Don’t forget if you click through those links and purchase through Perfect Supplements to use my code GENERATION10 at check-out to get your RGN reader 10% discount!). A quick baby and toddler note! When I had babies in the house, I just poured the powder in the cap right on my baby’s or toddler’s tongue. You can stir the powder into food like yogurt, smoothies, or even a spoonful of cod liver oil if you wish! 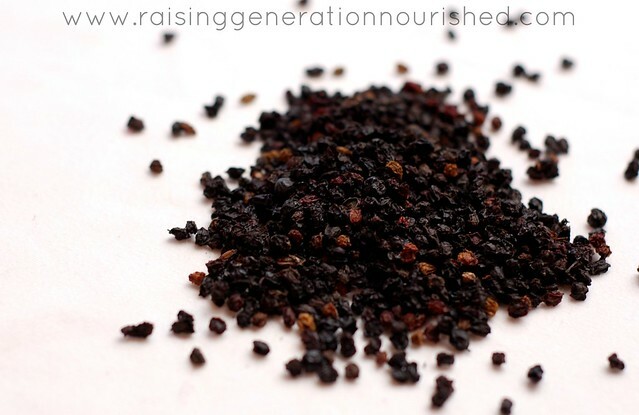 Elderberries are powerful virus killers and immune system boosters! When I get teacher email warnings of flu spreading, hand foot and mouth outbreaks, or other viruses, you better believe that elderberry syrup is coming out! You can bottle up elderberry goodness in elderberry syrup or tincture form and it is super easy to take because it tastes really good! 2 weeks before school starts I like to give the girls 1 tsp of elderberry syrup per day through the first week or two of school starting. If I get warning emails of flu or other viruses, I will do the 1 tsp per day for a good week or 2. 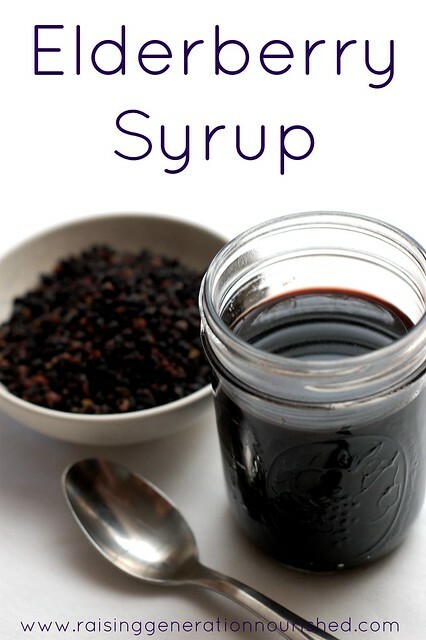 When my kids are coming down with something or are home ill, we do 1 tsp of elderberry syrup every waking hour until they perk back up. You can pop up to the Vitamin C section in the preventatives section of this post to read about why the Vitamin C is so crucial in fighting illness, but just wanted to review here that during the onset of illness or illness, I double their vitamin C dose until they perk up from being sick. Years ago, I had a chiropractor friend where we were living at the time explain the benefits of having kids adjusted at the onset of illness to help them recover faster, and I have been amazed at how true this is. I have gone through a couple colds with the girls where we haven’t gotten to the chiropractor, and they just seem to linger longer. I asked our family chiropractor if he could explain why chiropractic is good for the immune system, and his response made so much sense I asked if I could quote him! Proper alignment enhances circulation and drainage of fluids. It also optimizes nerve function to help calm the body’s stress response (sympathetic nervous system), and enhance the body’s healing response (parasympathetic nervous system). 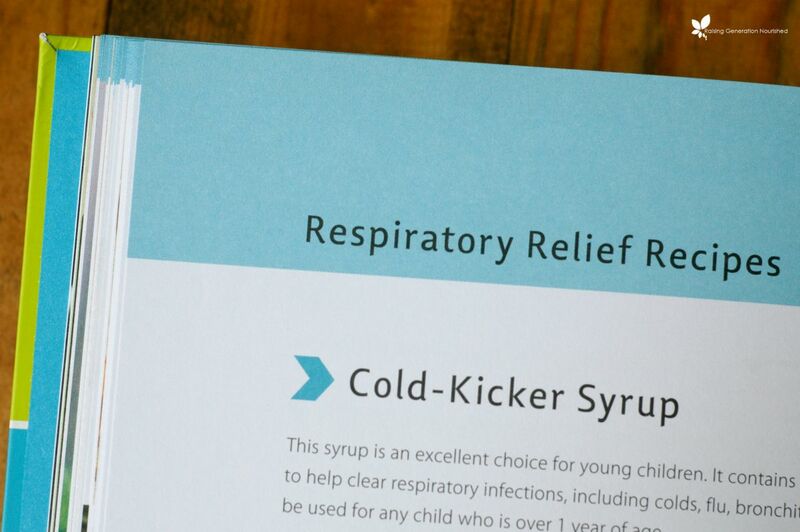 This has been shown to not only reduce illness, but help children recover from illness quicker. Essential oils were fairly new to me when my daughter started school a number of years ago, but I have come to realize just how effective they are! I have been without them during illness and really could feel how much faster my kids got better when germ targeted oils were diffusing during illness. We do not diffuse germ targeted essential oils all year every day. That is not how they were intended to use. I diffuse germ targeted essential oils during the first week or 2 of school starting, during school bug outbreaks, and when my kids are ill. I have found them super effective especially diffusing them in their room overnight – when they wake up acting like a whole fresh new kid you know something is working! I love that! Our favorite germ targeted essential oil blend is THIS kid safe blend . I am a huge fan of using oils that are safe for kids – many germ targeted blends are great for adults but not intended safe for kids. This Kid Safe blend was created to be safe for kids and it really works! I decided not to put the nourishing menu in the “preventatives” section, even though that is exactly what it is, because I didn’t want it to get skipped by. 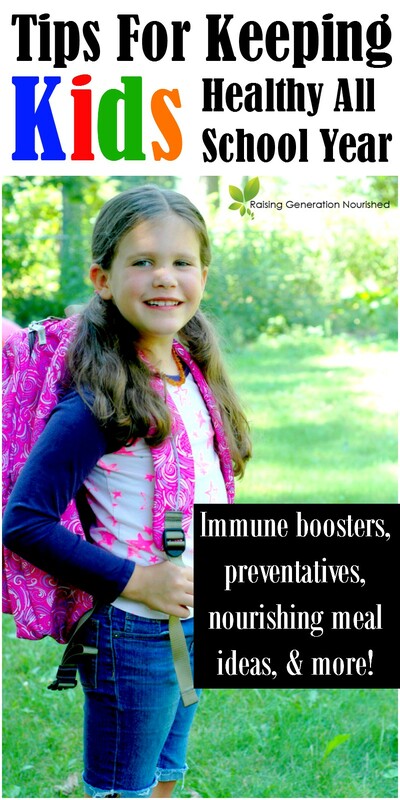 Children’s fuel makes a difference in their body operating correctly, including the immune system…period. But wait! Before you write this section off because your kiddo might not be the best eater, hear me out! Eating well for their immune system doesn’t have to mean boring veggies they might turn their nose up to. I think the biggest thing we can do is get the sugar and processed food out, and get the nutrient dense items in. Ensuring they are getting adequate amounts of friendly fats will help their hormones and sugars stabilize, which will keep their immune system functioning. Lots of pastured butter, lard/tallow, coconut oil, used in your cooking and serving of food. Bone broth is a daily goal of mine to get into my kids during the school year. Whether in a tea cup with butter at breakfast, or in their school thermos in the form of a kid friendly soup like tomato soup, broccoli soup, chicken noodle soup, or butternut squash soup, daily bone broth replaces missing minerals in the diet, nourishes the gut lining with collagen, and is an overall comforting addition to their day. 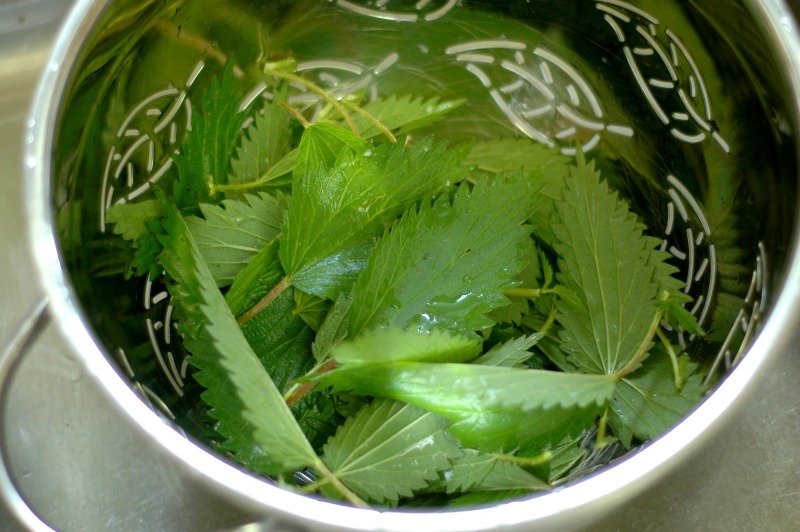 Nettle Infusions are another great way to replace missing minerals in children’s diets which will help organs and systems in their bodies operate more efficiently. 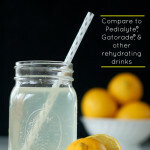 The infusions are also hydrating and kid friendly in taste. It packs up in the water bottle for school to drink easily. It is a great mineral rich boost at lunchtime! You can use immune booster smoothies once or twice a week for breakfast. If your kids really love smoothies you can try these green smoothies for kids as well to change things up. 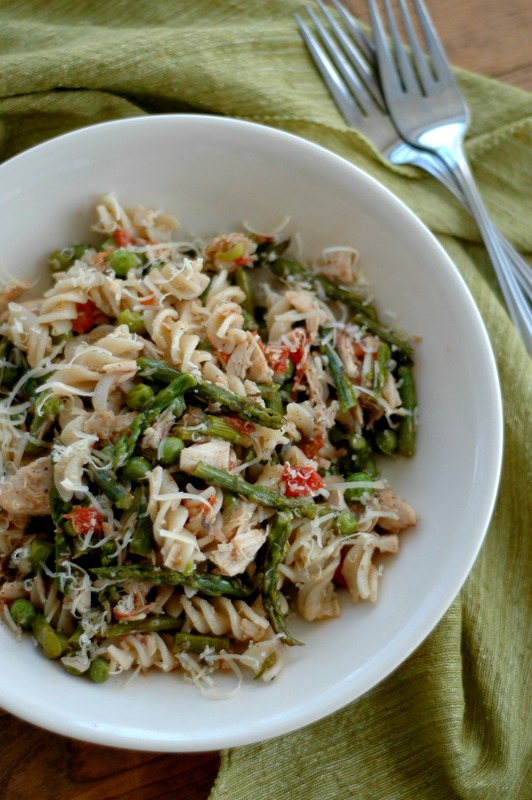 You can browse the meals in the Recipes tab at the top of the blog, and you can also get a collection of my family’s favorite staple meals in my new book Nourished Beginnings . The recipes in the book are meals my girls have grown up on, and are on our table weekly! Bring back the practice of caring for postpartum moms with these nourishing ideas to take to a new momma in your circle. This post has been right at the tip of my heart to share for almost a year now. While the heartbeat of the passion behind the Raising Generation Nourished blog message revolves around nourishing our next generation of kids, in all reality the goal of raising a healthier generation of kids begins right at the very beginning…with momma. My sweet friends I am so encouraged by what I read and see today for postpartum momma care compared to what I saw and experienced almost 7 years ago as a brand new momma myself (which was practically nothing). We have a ways to go in my opinion, but the rise of a generation of women that are choosing to care for themselves and the women in their tribe is breaking down walls of generations of women that have had to walk through the season of postpartum alone. My very first postpartum experience was one drenched in severe postpartum anxiety. I had a massive hemorrhage after I delivered her to the point of them almost losing me, and my body was just flat out not working right. Top that off with a very “Type A,” get-it-all-done-myself type of personality, and it was a recipe for disaster. I was horrible at asking for help. Honestly, I’m not sure what new mom is. 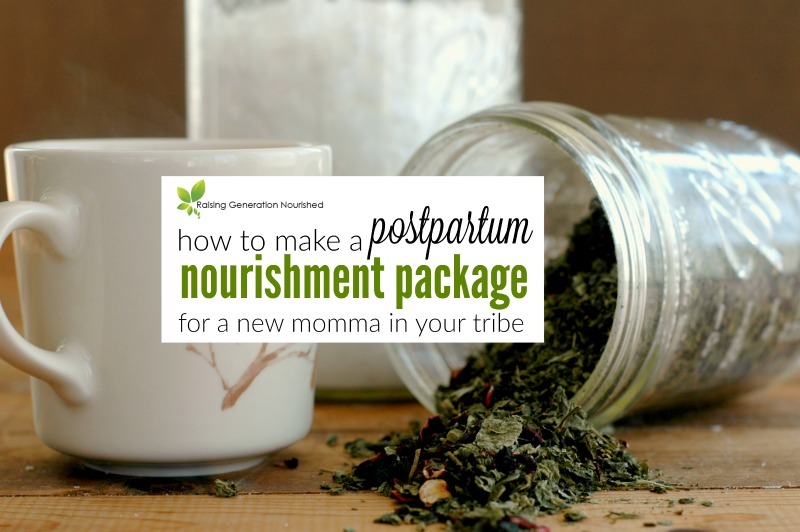 My postpartum experiences are what have brought about this practice of making my new momma nourishment packages. I promised myself that if there was a momma in my circle, they were going to be cared for without them having to ask for help. 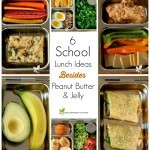 So here are some of my suggestions to include in your own nourishment packages! These are just some ideas to get the ball rolling – I hope it serves as an encouragement to you to take care of the mommas in your circle. Because really if we have a goal of raising a nourished generation, it really does start with momma. Young momma, this encouragement is for you. It is ok to accept help – yes you are going to need help if you want to maintain your health, and that is a promise. You, dear momma, are the heartbeat of the home. When you are taken care of the rest of the house will run within a beautiful rhythm. You are worth caring for – your baby is worth having a momma that is cared for. Ok! Onto my nourishment package staples! This is sort of a given, but I wanted to share with you some of the food staples I bring to young moms to replenish their body postpartum. The goal here is super nutrient dense – but also easy prep without being processed. It seems like a tall order but it is so do-able. The key is to just double batch for your family so you aren’t overdoing yourself trying to take care of someone else too. Meals, soups, breakfast cookies, snacks etc all can be easily double batched to feed your family for a meal and another one in need. 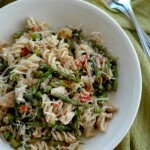 If you have a staple meal you love to bring new moms go for it! I would encourage you to sneak in a little grated liver if it is a meat dish as momma and baby would really benefit from the added nutrients from grassfed liver. 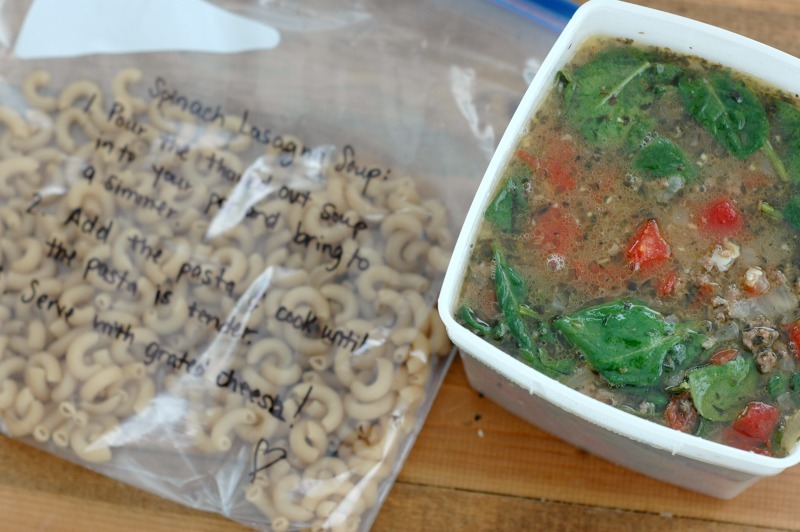 Bone broth rich soups are my staple meal and I pack spinach lasagna soup most of the time. I just cook the soup to the point of adding the noodles and stop. 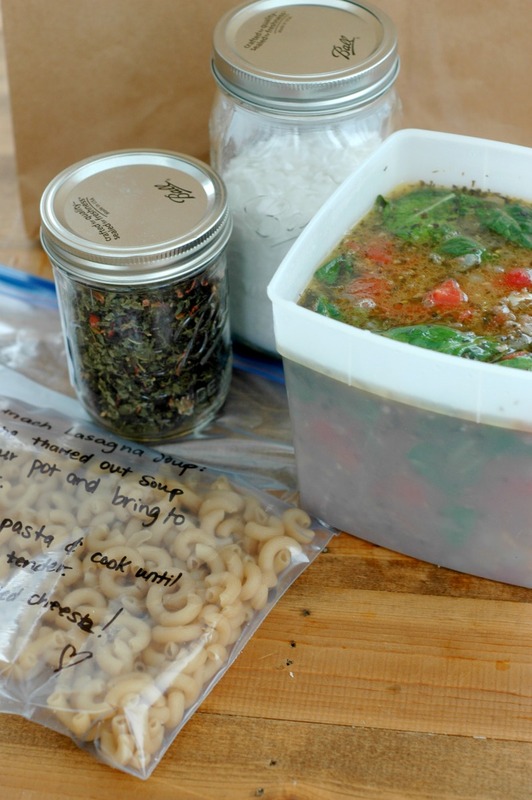 I pack up the brothy soup part in a freezer safe container and the noodles in a separate bag with instructions to bring the soup to a simmer and add the noodles. It is a very easy prep that anyone in the house can make from the new momma to daddy or a relative that might be visiting. The other great part about this soup is that it is super kid friendly with all the noodles. If there are other little ones in the house it helps to have them fed well too! It really does taste like lasagna when you top it with cheese too – I have had rave reviews of kids eating this one that aren’t used to real food styles of eating. I also like to pack in smaller jars of easy brothy lunch soups that can go in a mug easily to sit next to momma while she nurses. 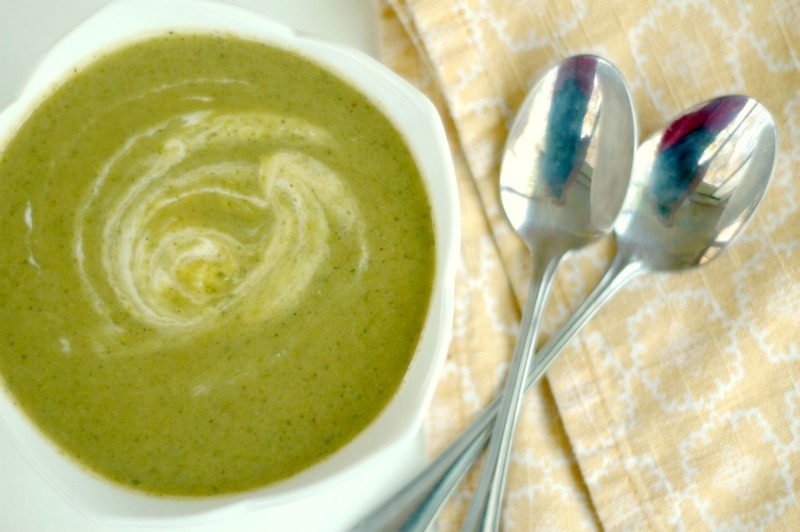 Simple soup purees like squash soup, broccoli soup, and tomato soup work well, and will get momma extra broth for mineral boosting and recovery that she needs. You can also pack momma’s freezer with breakfast cookies to make for quick midnight nursing snacks or early morning pre-breakfasts. They are also a favorite of any other little ones that might be in the house and make for an easy breakfast for mom to serve. You can try these Ultimate Breakfast Cookies, Lemon Breakfast Cookies, or Molasses Breakfast Cookies. There are so many combinations you can pick from in this category. My goal here though is zeroed in focus on replenishing momma’s minerals and hydration from having a baby. Teas for boosting milk supply are great, and momma may already have some of those, but again…the focus here is on mom. If momma’s minerals are being replenished, then believe me, the milk will follow. I like to mix a pint jar of nettles and hibiscus with instructions to just steep a tablespoon of herbs per quart jar of hot water into an infusion. Making nettle infusions was absolutely key in my energy as a new mom as well as my milk production (and yes I was one of those that really struggled with nursing supply – I had to work my tail off for my milk). 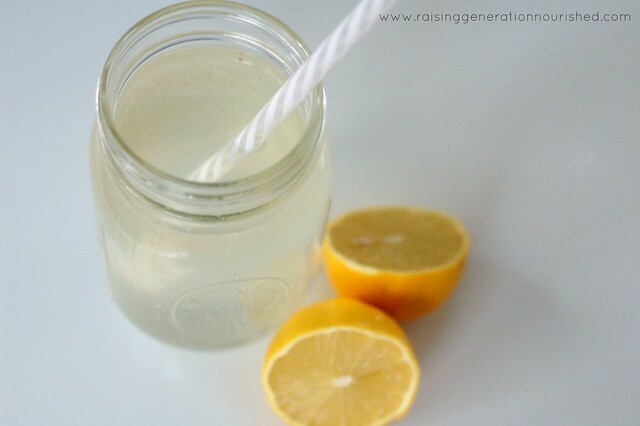 It is also a good way to hydrate mom without diluting all of her minerals with too much water. 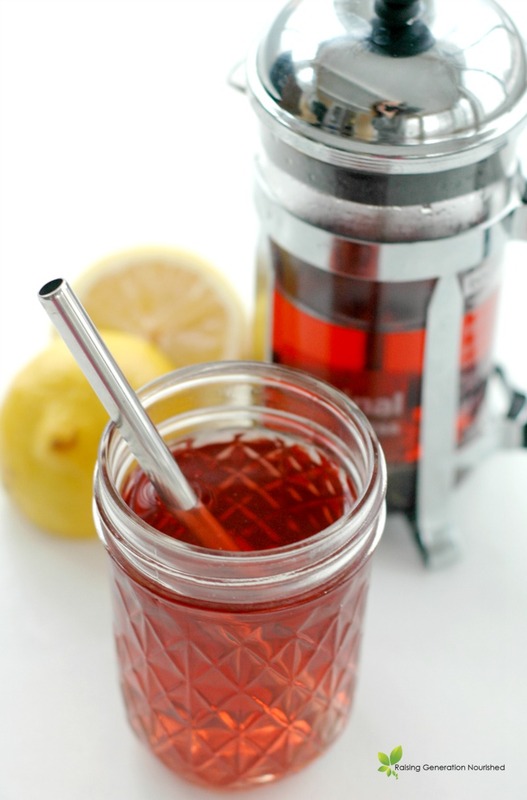 You can read more about how to make herbal nettle hibiscus infusions here – while the post is geared toward kids, the method is the same for adults as well. It is so easy to lose yourself in those first few months (probably more like the whole first year!) after having a baby. You literally eat, sleep, and breathe a newborn, and as wonderful as it is, there is a big problem if momma is not taking some “me time”. Twenty minutes momma. You are allowed 20 minutes to not be attached to baby, cleaning a house, or tending to other little ones. Momma…you are allowed to take care of yourself with some alone time. Ok, whew! Now that that is out of the way, let’s talk about mineral baths. My sweet friend Jessica from Simply Health Home was the one that really got me started on postpartum baths. This was key in not only my physical recovery…but my mental recovery. The whole “me time” thing. A good friend is one that will be honest with you – and she was persistent on being gently firm with me about taking some alone time and she taught me a lot about how to add different salts to baths for recovery after baby. I typically write momma a little reminder note attached to quart jar of bath salts to take some time for herself. 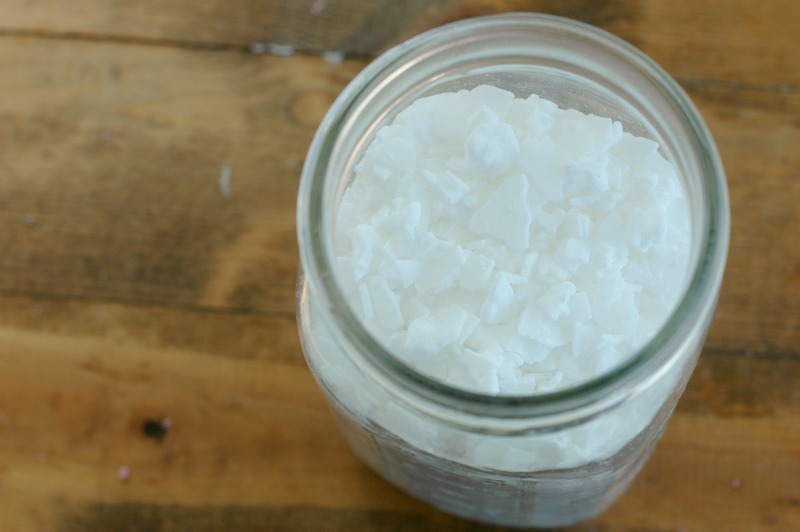 I like to put 1 cup of epsom salt , 1 cup of magnesium flakes , 1 cup of baking soda, and 1/2 cup dead sea salt in the jar . You may add a couple drops of lavender essential oil if you wish, though keep in mind not everyone tolerates essential oils in a heated environment like a warm bath (I am one that cannot) so I tend to leave them out unless I know for sure. She can pour the whole jar into a bath and enjoy some time to gather her thoughts and take care of herself. Ok! So keep me posted on your endeavors! I would love to see your nourishment packages for the new mommas in your life – tag me up on Instagram, Twitter, or Facebook! We are truly all in this together – I’m determined to change what postpartum care looks like by the time my girls become mommas. 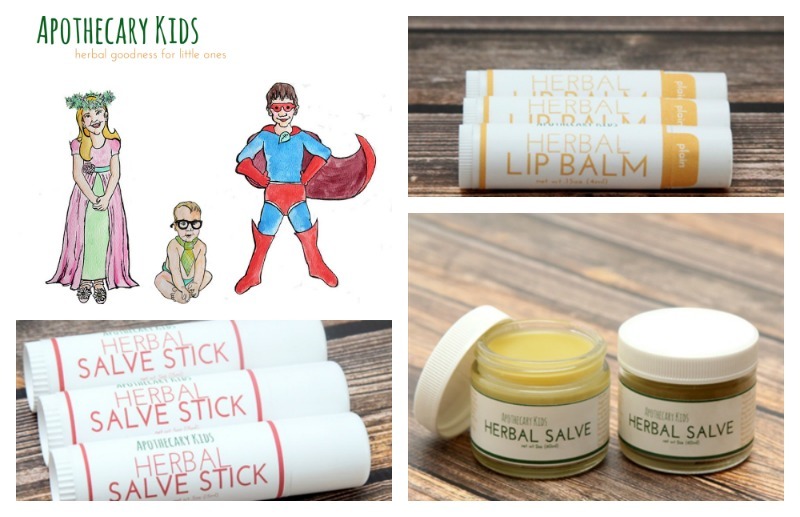 A kid friendly, hydrating & mineral rich herbal infusion made with busy kids in mind! An almost daily staple in our home, I can’t believe I haven’t posted this nettle infusion recipe before today! This nourishing nettle infusion stands right alongside bone broth in our home as mineral rich boost for busy bee kids and is one of the first teas I like to introduce to their palates to develop a love for herbal tea. As little ones, I like to give sips right off my tea cup or glass around 6 to 9 months old. Obviously not a replacement for breastmilk, letting baby take tastes of an infusion like this helps create a taste palate for tea for later in childhood. I can’t tell you how nice it is to have a toddlers that willingly drink a cup of mineral rich tea with their lunch, or sip on a healing herbal tea when ill. If you have big kids this is for you too! Even if you have a big kid or teen that has never had a cup of tea before today, I left instructions on how to slightly tweak the recipe to make it palatable for them. 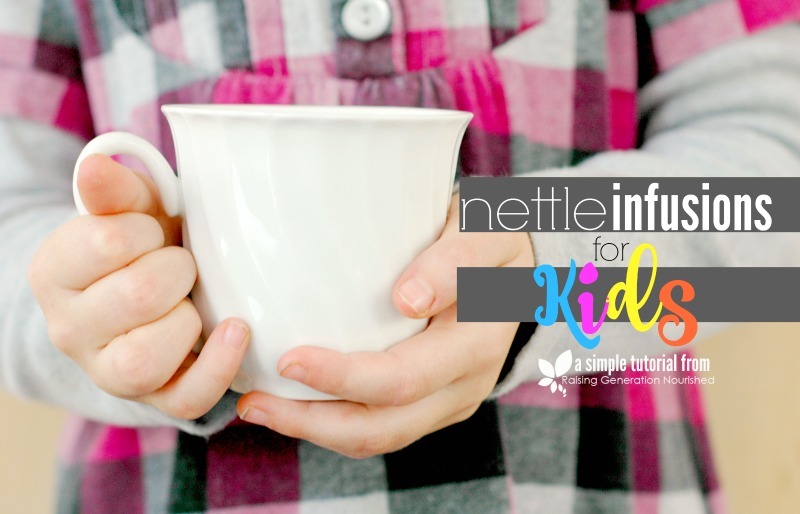 Nettle infusions are a fantastic way to hydrate and boost minerals for kids that are busy with school all day, in sports, or are just busy outdoors playing! It is a great replacement for working on getting juice out of the routine in the house, and a little lemon and raw honey make it taste really good. Those who follow my Instagram account know that I often pack nettle infusions in my first grader’s lunch for school. While the students take a mid morning break for a quick snack that includes water, as I have volunteered in the room I notice just how little the children drink during the morning! You can physically watch some of them start puttering out by lunchtime…including my daughter who gets a very nourishing breakfast every morning. They need a big re-fuel at lunchtime and that includes hydrating. You don’t need fancy equipment to get started – just the loose herb and a quart mason jar is all I used for years. I have a dedicated French Press that I have been using just for infusions for a couple years now, and I love how convenient they make tea making. No straining or fuss. Just push down and pour. I even have a smaller French Press so that my 2 and 4 year olds can do it themselves! 2 tsp raw honey This is optional for using for those bigger kids that might need a little sweet to make it more palatable. Leave this out for the babies and toddlers to work at developing their palate for tea without honey. We use a local raw honey - the linked brand is a good one if you don't have access. 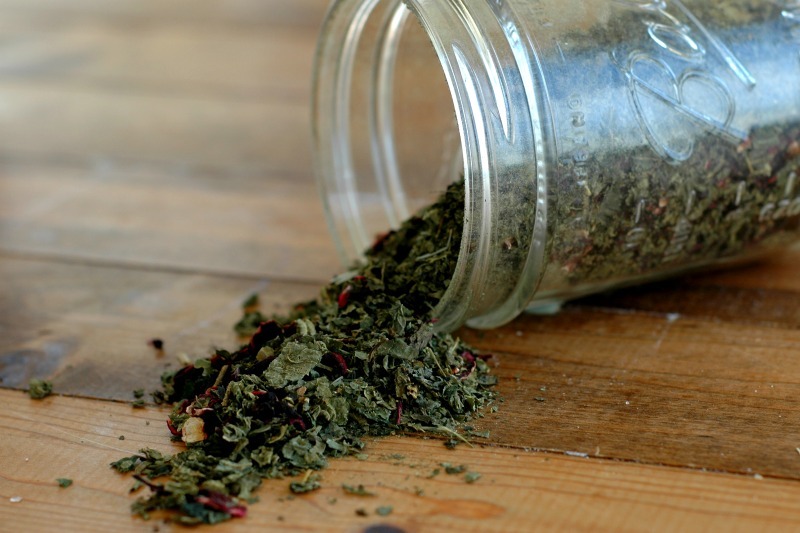 Put the loose herbs at the bottom of your mason jar, French Press, or other glass container or teapot. Pour the hot water over the herbs and let them steep anywhere from a couple hours to overnight. You can steep up to 24 hours if you wish. My routine is to make the infusion at night before I go to bed and then I strain it off in the morning for school lunches and myself so that I can make another infusion for the afternoon that steeps all morning. Do what works for you! After the infusion has steeped, strain off the herbs and enjoy. 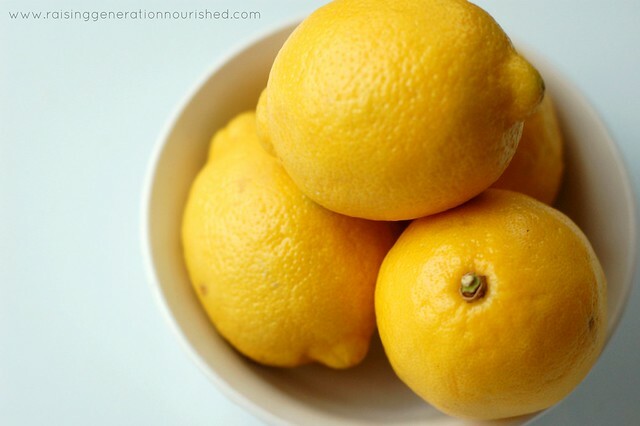 You can add a squeeze of lemon (my favorite!) and for the kids new to herbal tea you can drizzle in the raw honey. Just shake up the infusion and honey in a jar and it will dissolve. 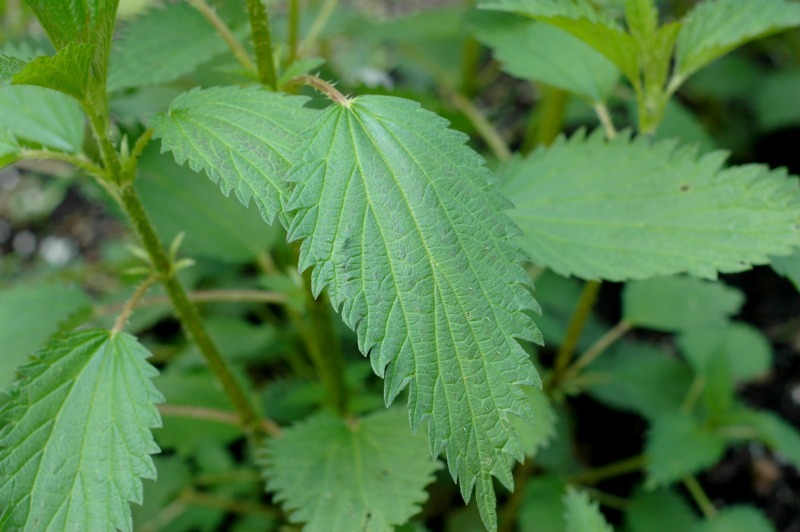 The hibiscus herb gives a slightly sweet and tart flavor to the bitter nettles so you actually might be surprised at how much they like it without the honey. It is certainly enough with just the hibiscus herb for young palates in babies and toddlers. 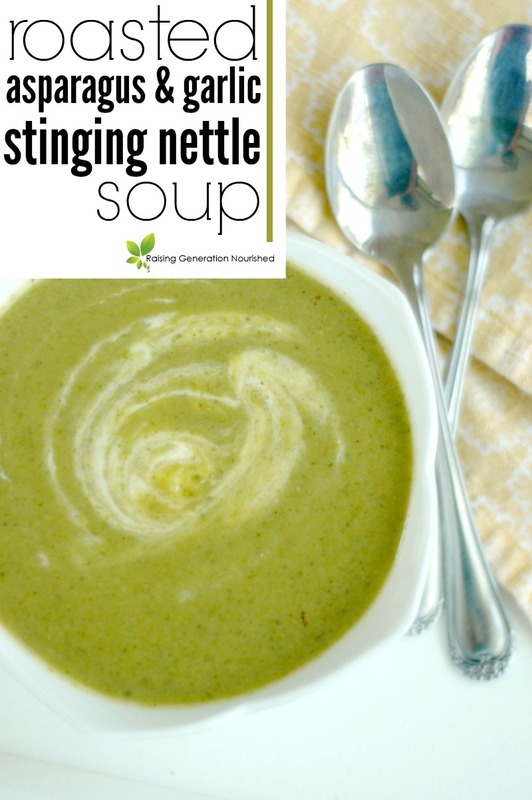 For more nourishing staples in our home, you can follow my Nourishing Staples board on Pinterest! 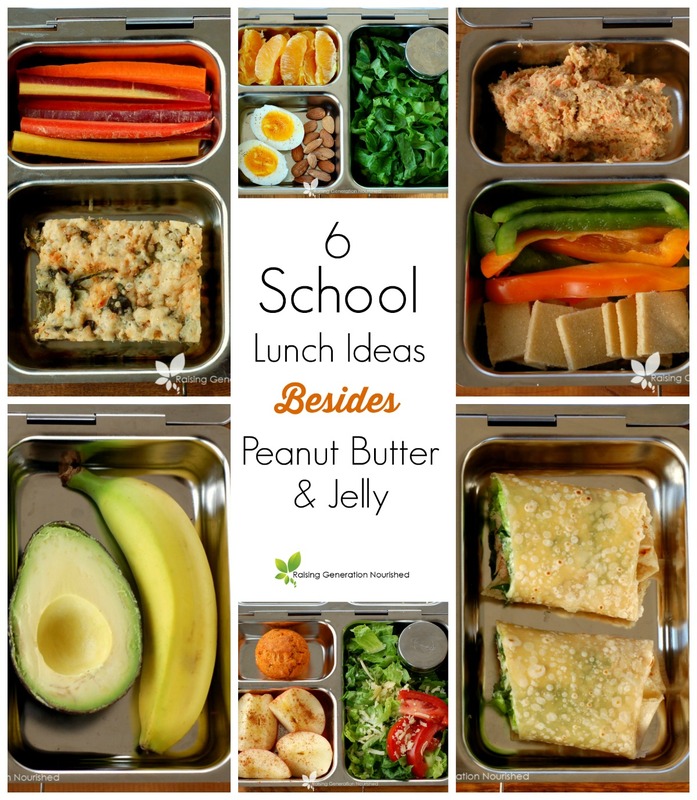 6 School Lunch Ideas Besides PB&J! 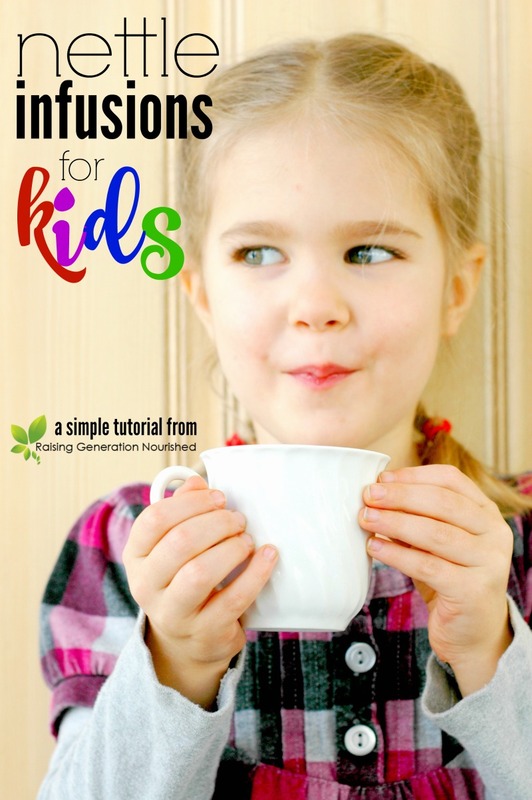 This post is a review for the book Natural Remedies for Kids . I was given the book for review purposes and to compensate for my time – please know that I never recommend products that I wouldn’t use on my own family. There are affiliate links for the book in this post – it does not make the price any different for you, but helps keep the information on this blog free to you! There was something about that first time I became pregnant that brought this raw, protective momma bear instinct out in me. I was always intrigued by naturally going about health related issues, but was rather laid back in studying too much into things. While I definitely did my research about certain health topics, I never really gave too much thought to simple things like a common cold, skin rashes, or bug bites. But the first time one of my kids got a simple cold I stood in the pharmacy isle at the store completely overwhelmed, and there was something about those ingredient labels that sent big fat red flags up in my momma bear head. Motherhood has a way of throwing you into research and learning with both feet first doesn’t it? From that day on I started looking more into how to avoid modern chemicals in products and fell in love with how simple ingredients found right in nature were created for the purpose of balancing, healing, and soothing. Start small. Don’t go broke buying every herb on the planet all at once, or seeing one article go out and buy everything. Pick one or two things thing commonly hit your home – say maybe the common cold, and allergies and try things out from there. Give it time. Some natural remedies do in fact heal or soothe super fast. However some work with your body to help heal more naturally. We have become quite the instant gratification society with our meds that kill a headache in 10 minutes. Let nature work it’s magic over time. Sometimes those little things like a cold or flu are our body telling us it is time to rest. Getting better in a day isn’t doing your body any favors when the illness was really meant to make your body rest in the first place. Don’t give up. Just like most things, what works for some doesn’t work for everyone all the time. There is usually more than one way to approach things. Be patient and give things some time, and if it doesn’t feel right try another. 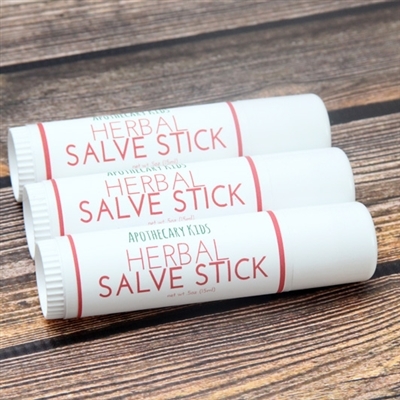 While I am 3 kids into this thing now and have first hand seen the benefits of natural remedies with my own eyes, I most definitely am still a natural remedy “newbie” – I still have to look things up when a new ailment happens in my home. I still have to brush up and remind myself what certain herbs or tactics work best for this or that. Which is why I was super excited to get my hands on the new book Natural Remedies for Kids ! I need something quick that I can pull off my shelf and easily read when I have something new to tackle! 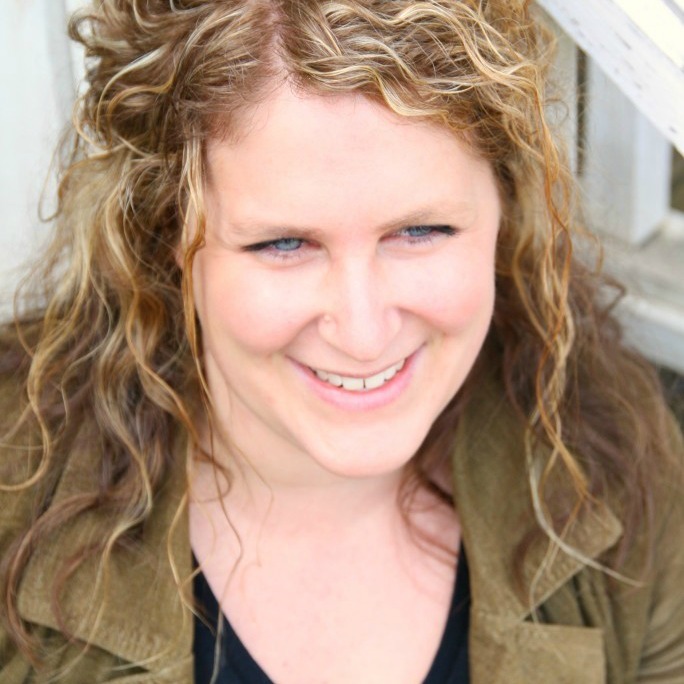 My friend Kate Tietje who blogs at Modern Alternative Momma, is an experienced momma of *5* naturally raised kids. With that many pitter pattering feet running around, you bet she has pretty much seen it all! She wrote the book in collaboration with Dr Bob Zajac, M.D. and throughout the book there are easy to find “Dr Bob Says” sections with very informative tidbits. 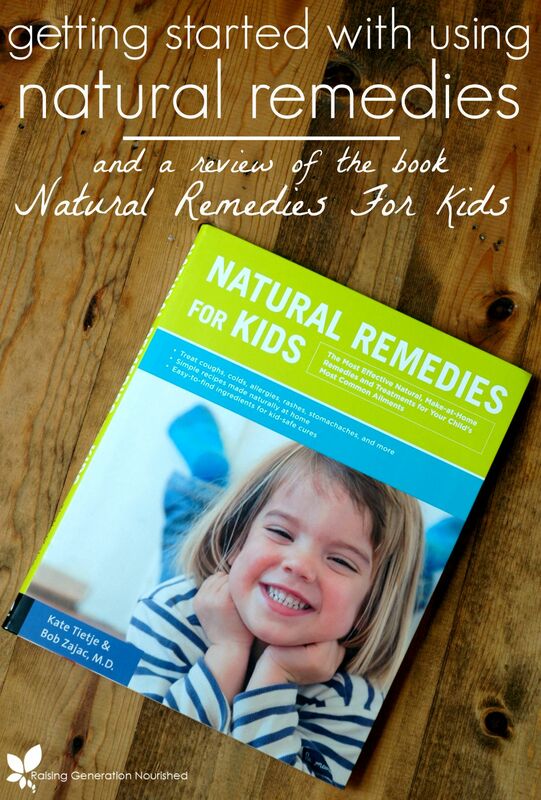 Natural Remedies for Kids is a comprehensive guide to just about any remedy and treatment known to childhood! It is so easy to read. I am not an herbalist. In fact sometimes herbal books get really overwhelming to me shooting right over my head. This book is very well laid out with sections that describe what the ailments actually are, how it happens, and how it is best treated, soothed, or remedied. Better yet, the ingredients are all easy to find. 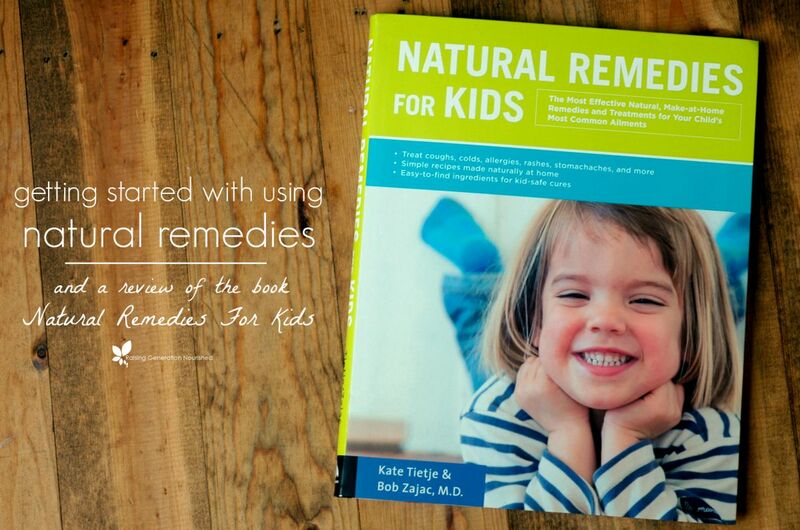 Natural Remedies for Kids is on **SALE** now on Amazon – over 40% off so grab it up! Quick preface! I’m not a doctor and don’t claim to be one! If you have a kiddo with really labored breathing or really struggling with a cough, you should be seeking medical assistance via ER or your doctor’s office. There is definitely a time and place for both! This is my own experience using onion poultice with my girls for chest colds and you can use the method at your own discretion. Product links are affiliate links. It does not cost you anything and helps maintain the free information on this site, as well as answer the questions of “what brand do you use?” Please know I would never personally recommend any product I wouldn’t use on my own family – what is linked here is exactly what I use. I’m not sure there is a much more of a panicking middle of the night wake up call than a barky seal cough from your child. The very first time it happened to me as a mom, my oldest was about 3 and it scared the living daylights out of me! I remembered reading that cold air helped them calm a cough down so my husband held her in a blanket on the snowy front step of our house, and within seconds her cough calmed. 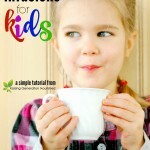 I learned quick that it is really no fun to have a sick kiddo and I started studying tried and true natural ways to help children get through an illness. As it turns out many simple, old natural remedies that our great grandparents probably used are super effective, and an onion poultice for chest congestion is one of them. The combination of the warm, moist onion poultice with the natural expectorant quality of the onion help to break up the congestion. My experience using this on my girls has been very successful and within a good 10 minutes of wearing the pack they are able to cough more freely and easily to loosen it all up and get it out. Be sure the poultice isn’t too hot. What feels warm and good to you is probably still too hot for little ones in my experience. I let the poultice cool off for a good 5 – 10 minutes after coming out of the pot. It shouldn’t be uncomfortable or hurt – it should be warm and comforting to them. Let them pick out the towel to use. 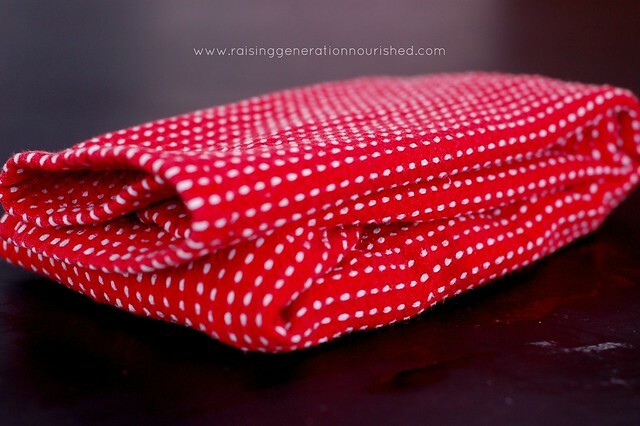 I actually got a cheap pack of tea towels with bright, fun colors just for using with onion poultices for the girls. It came with 4 towels so I have enough to rotate around if I have more than one with a cough and if I have to get 1 or 2 into the laundry. Spray some lavender essential oil or other essential oil blend that they like on the top of the poultice that will be facing up so they can smell that instead of the onion. This last cold we ran through the house I actually sprayed the Calming the Child blend from Plant Therapy, and really felt like it kept things calm too. I have a small spray bottle with water and about 10 drops of the EO in there. Just shake it up before you spray. You only need a small spray or 2! If they are really sensitive to the onion smell you can put an extra towel over the top of the poultice and then spray. Get a distraction going *before* you put the poultice on. Get a stack of books next to them for them to read or for you to snuggle up to them to read to them. We don’t have the TV running all day, but when you need a child to sit still for 15 or so minutes, putting on an appropriate educational show or musical isn’t the end of the world in my experience. I used the girl’s LeapPads for games while they lay there too. One of my girls really liked the idea of making her a “nest” to lay in on the floor while she had hers on – a big pile of blankets in the shape of a circle with her favorite stuffed animals (and her big sister laying next to her too!). I’m not against a reward system for the really little ones. My 5 year old can understand the importance of sitting still for the poultice to work, but last year my 2 ½ year old did NOT. Doing 5 minutes or so at a time and getting a sticker or something helped move things along without the fight. This year at 3 ½ she understands better and wanted to get better so reasoning with her is just much more do-able. Let them know the why 🙂 You can tell them it will help them get the gunk out of their chest so it doesn’t get infected and so they get better faster! It’s amazing what they understand! And amazing what they will go from not wanting to do, to willingly doing when they know what to expect. And really the warm pack feels good and is really comforting and warm – once they feel it usually my girls are willing to have it on for a while. 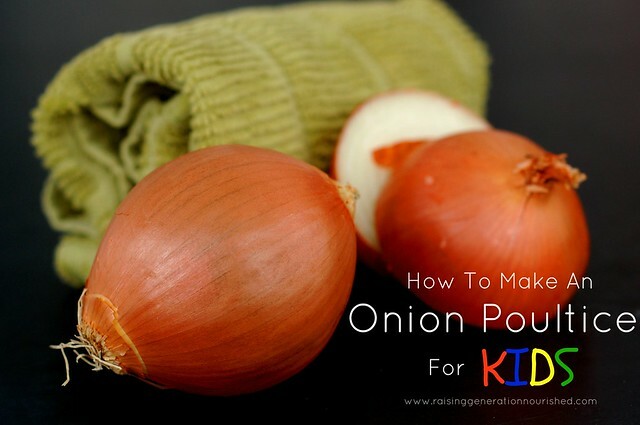 So here is how to make a simple onion poultice for kids! Please keep in mind that if your child is really laboring with their breathing and things just don’t feel right you should be going to the ER and/or calling your doctor. Put the water in the bottom of your sauce pan along with the onion and bring to a simmer with the lid on for 10 minutes. 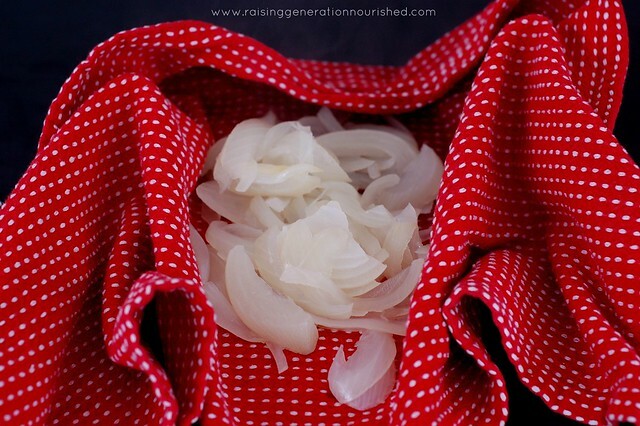 Strain out any extra liquid and put the steamed onion into a thin kitchen towel or tea towel and fold it up. I like to lay the towel out horizontal and fold the top and bottom up over the onion, then fold the sides in – like making a burrito. Their little chests are so tiny so just be sure the onions in the middle aren’t all spread out. Let the poultice cool for about 5-10 minutes before applying to your child’s chest. My youngest needs it cooled even longer as her tolerance for warm even in a bath is cool to me! Let the poultice sit on their chest up to 20 minutes if they will sit there long enough. You can re-heat the poultice throughout the day. I like to just put the whole poultice right back in the pan and warm it on low heat. 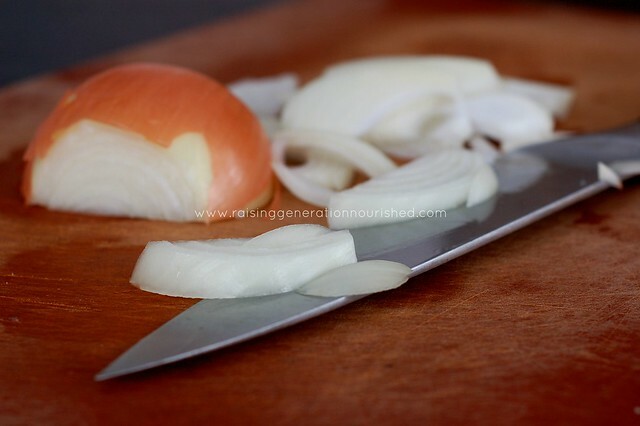 Discard the onion after using it for a day. Here is another great resource about naturally dealing with chest congestion. I also like to use the Hylands Cough N Cold remedy at nighttime finding it really helps with calming the cough and helping them rest. You can also read about natural flu remedies HERE and how I was able to clear up an ear infection in my oldest naturally HERE. 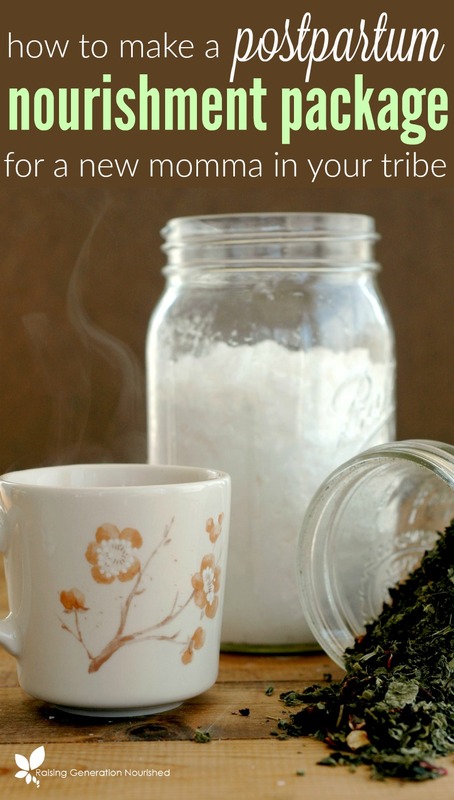 And come follow my pintrest board My Herbal Ways for more natural and DIY remedies. Disclaimer :: I am not a medical doctor, nor do I claim to be one. I am a well read, well educated momma who chooses natural remedies first before choosing mainstream medicine. That is my choice for my children and my household. If that doesn’t resonate with you, that is ok! Please be respectful in any comments, however. This is also *my* story. Many of these remedies may and can work for other children but please keep in mind every child is different. I do tend to really trust my children’s bodies to fight infection naturally because they are so well nourished while they are well. Healthy, well nourished children’s immune systems compared to children with compromised immune systems, junky diets, and/or multiple other health issues going on is like comparing apples to oranges. Please use your own judgment as to how to treat your own children. Product links are affiliate links. It does not cost you anything and helps maintain the free information on this site, as well as answer the questions of “what brand do you use?” Please know I would never personally recommend any product I wouldn’t use on my own family – what is linked here is exactly what I used during the ear infection. So it all started with a phone call from school. I knew Chloe had looked a little tired that morning, but it was the end of the week and she is usually tired by Friday as this is her first year in full time school. I didn’t give it much thought, and she had brushed me off when I asked her if she was ok that morning. She just said she was tired but really wanted to go to her reading group that day. Her teacher called about mid-morning and said Chloe just wasn’t herself, crying a lot and wasn’t feeling well. I picked her up and could tell right away by the glassy eyes that she wasn’t well. She cried all the way home about missing her reading group, but when I tucked her in bed she fell right to sleep. She woke up saying her ear hurt and I called the chiropractor to get in for an adjustment right away. She took a peek in her ears, did an adjustment or 2, and did some drainage massage. We swung by the store on the way home for some garlic/mullein ear oil (yes I know they can be made but with the baby and another toddler I just didn’t have the time) and started what would be a very long weekend. 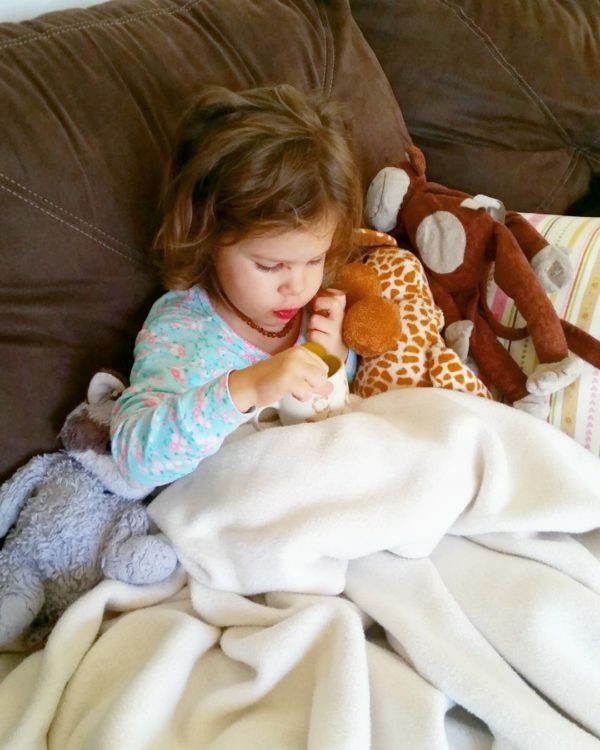 We really kicked this ear infection well though, and I wanted to share how we did it! 1. Chiropractic adjustments to address the ear infection/drainage. This is vital. At the first sign of the ear hurting our chiropractor was the first person I called. There are simple, gentle adjustments that can be done to help with drainage flow connected to the ear. Everything is connected to the spine. Certain points in the cervical spine will be subluxed with ear infection and fixing that helps with healing. We went a total of 5 times within 2 weeks and it was worth every penny to me. After one of the visits Chloe told me that she could feel “water” draining in her ear. After one of the last ones we had an hour later she could hear 100% better. 2. Let the “bug” run its course. The vast majority of ear infections are viral. They just have to run their course. Our pediatric chiropractor said upwards to 80 percent of them are viral. And it takes time to let a virus run its course! Can I just be real here a minute? Man, it was hard to watch her in so much pain. This was my first real ear infection in the house, and it tore at my momma heart to see her sick. I kept telling myself, maybe tomorrow it will be better – because the minor illnesses that have gone through my home have been quite short lived. This was 5 (five!) days of pain (It started in one ear for about 3 days and then when that one got better it had moved into her other ear!). 5 days of religiously keeping up on natural remedies. It was exhausting. So while we wait on the bug to run its course we have to do something about that pain. I was surprised at how well the garlic/mullein ear oil that I had helped. We dripped these in her ears hourly at some points. She would tell me how much it helped, and I really think it took the edge off during the day. I also used the oil with a drop of lavender essential oil to massage downward from the neck behind her earlobe downward as our chiropractor showed me how to do to help move any drainage. She said this helped with pain a lot too. I used a warm coarse sea salt pack on her ear/neck area after dripping the oil. I followed the instructions on the salt pack from THIS article. She LOVED this – she had the salt pack on most of the day – it was very soothing to her. 4. Boost the immune system. I had her taking a whole food sourced vitamin C and cod liver oil to boost the immune system. I also used Plant Therapy’s KidSafe Immune Boom roller bottle on her feet at bedtime. And since the majority of the immune system resides in the gut, she was taking quality probiotics daily. I even added this probiotic that has a strain that is specific to the ear. She was not up to eating much, even her favorite bone broth, but she would sip on these immune booster smoothies here and there. I was also making her nap and letting her sleep as much as she wanted. Rest for the immune system to fight is vital. Two of the nights I had her go to bed much earlier than her sisters much to her dismay, but it was worth it – she always passed right out and slept hard. And I knew she needed it. There were a handful of times I used some chamomile tea in her bath, or had her take some Rescue Remedy to help her relax so she could just rest. 5. Naturally help kill the bug. I actually started out dripping my breastmilk in her ear, but my toddler is in a process of weaning and it was getting harder to hand express or pump as my supply is significantly different. If you are a breastfeeding momma your breastmilk is naturally antibacterial and antiviral! Yeah! So go for it and drip away! I did a drop in each ear about 5 times per day. After a couple days of the breastmilk dripping and deciding that it just wasn’t working for my weaning supply, I switched to dripping collodial silver in her ears to have the same effect on the bug. I actually feel like within 12 hours of starting this was when I saw her turn a corner. 6. Flush and detox the lymph. I wanted the bug OUT! 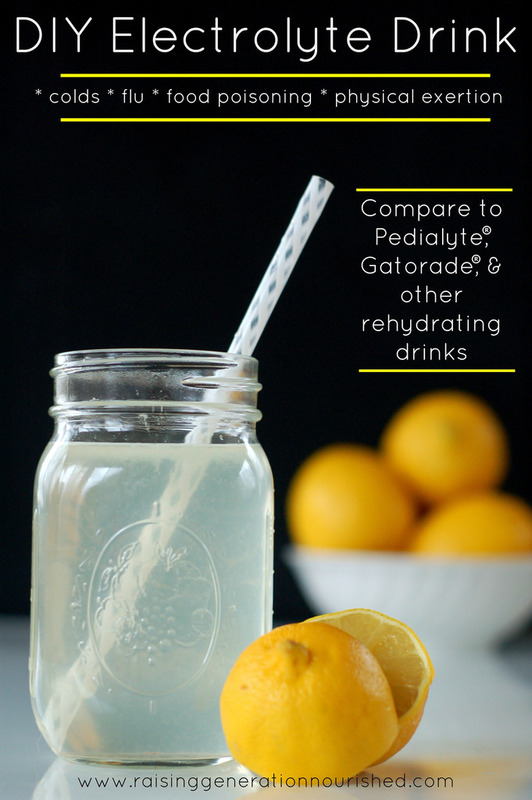 I kept her drinking this simple hydrating electrolyte drink since she wasn’t into eating much. And we also did dry brushing and simple detox baths. At one point she took a warm bath 2 times a day mostly because she asked for it – it was very soothing and made her feel better. To be honest the bath was when I saw her perk up the majority of the time. I did the dry brushing and then she took a warm bath with a cup of epsom salt and baking soda. I used lavender essential oil and Plant Therapy’s KidSafe Sweet Dreams blend in the bath at night to help with sleep. So what did we do after this epic ear infection? I treated as if she were still sick for about 2 weeks after. I religiously kept up on the gut nourishment with bone broth based soups, probiotics, and I even finished out the bottle of the probiotics that are specifically designed for ear health. Bedtime on time was a must, and I even said no to a family gathering the weekend after she was sick. I could tell she was still getting her strength back, and we can always see family another day. I kept sugar at a minimum, and while that is usually always the case for our house anyway, this all happened the week before Christmas…of course! She had one cookie on Christmas day, and I just didn’t make any or have it around. It wasn’t that big of a sacrifice to keep her immune system happy and not give it a sucker punch with a bunch of sugar. For now I am also keeping her off milk. Even though she has not had chronic ear infections, I am just being cautious since dairy and ear infections can be connected. Our raw milk share decreases from January until May anyway, so we don’t have a lot of it around. I will bring it back in this spring. And finally, I am being more consistent on being at our monthly well adjustment at the chiropractor. 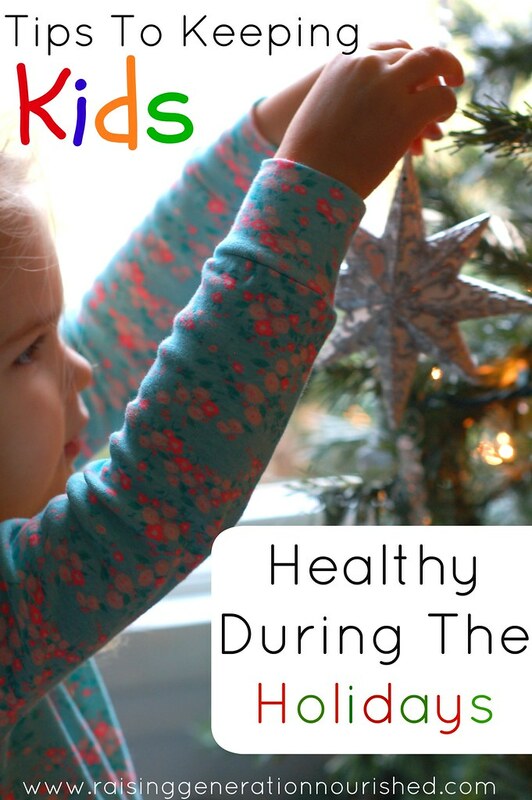 It is so easy for me to put it off this time of year with the roads being so snowy – but I really have noticed how monthly adjustments keep my kids sleeping well, and overall healthier. So tell me! 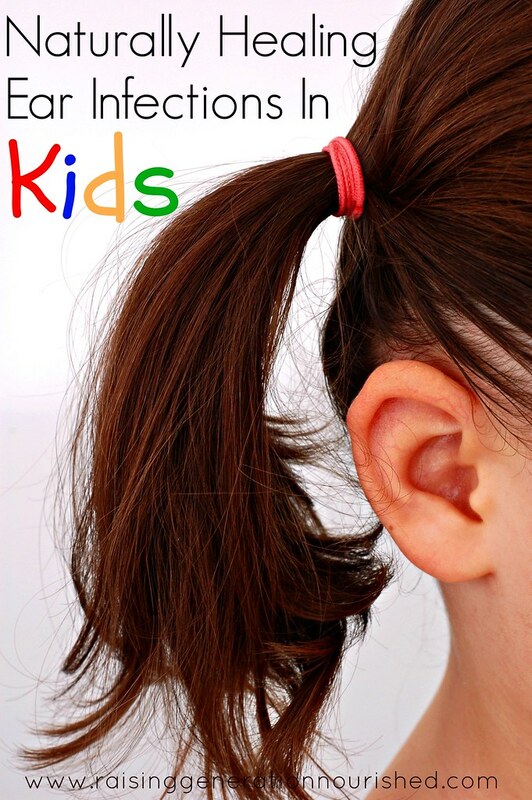 Have you treated an ear infection naturally at home? What worked for you? With the holidays in our midst, cold and flu bugs are just inevitable. We don’t live in bubbles, and our kids are sure to be exposed to whatever is floating around your area. 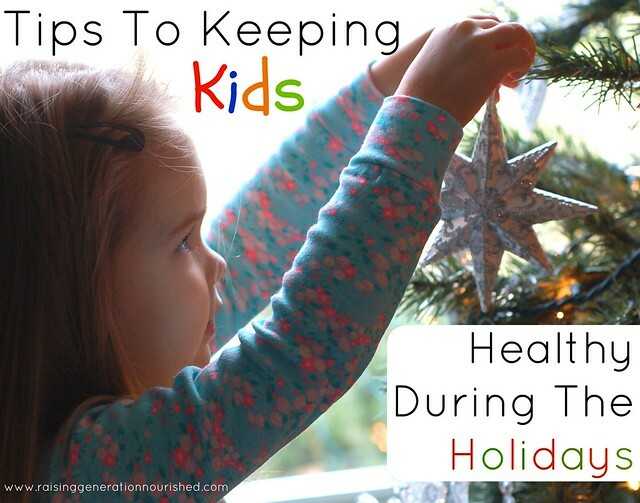 It sure does seem that the holidays have a tendency to bring on extra illness, but there are definitely some ways to give your kids the upper hand to fighting off the bugs and stay healthy so everyone can enjoy the celebrations to come. Don’t let your healthy preventatives routine slip up if you are away from home or have some changes in the schedule. If you live in a northern area that doesn’t see a lot of sunshine it is so important to keep vitamin D boosted through the properly balanced vitamin D and A in quality sourced cod liver oil. During illness we boost the cod liver oil . Pastured lard to cook in is another great source of vitamin D. Vitamin D is more and more in the forefront lately showing to be very effective against the flu in particular. Since the majority of the immune system resides in the gut, it is important to keep the gut flora balanced with probiotics through fermented foods and/or quality supplemental probiotics. I like to rotate this brand and this brand , along with weekly consuming yogurt and fermented veggies. During the holidays I like to give elderberry syrup or elderberry tincture a couple times per week. If the girls are run down or ill they get it daily until they recover which has never been more than a few days. Elderberries are effective virus killers and work well to boosting the immune system to fight virus off. I also supplement immune boosting vitamin C during this time to give their bodies an extra boost. I like to use a quality sourced whole food C such as THIS brand and THIS brand . You can read more about the importance of whole food vitamin C in this post. Before you label me as the Scrooge of the century, please hear me out. Sugar has a huge impact on our immune system. As in it weakens it. (See THIS article and THIS article for very informative evidence regarding sugar and the immune system.) It just isn’t worth day after day of junk their bodies aren’t used to. Listen, I’m all about a little fun! Absolutely have some fun making Christmas cookies, or your favorite holiday traditional treats like hot cocoa and eggnog, but it doesn’t need to be a daily (or even weekly) event. Just don’t go overboard is all. In case you are wanting more evidence, I do have an actual life story to relate to this as well. About 2 years ago I discovered a load of holiday “real food” treats that I wanted to try. I mean, come on! It’s “real food” right? It can’t hurt to have some real food treats every week through the holiday month, right? Wrong. Sugar is still sugar – no matter the form. So that year my 2 girls at the time had cold after cold and it never seemed like we could get better. I resolved never to do it again and I have not regretted that decision since – the last couple years the girls have had 1 (one!) cold during the entire winter, let alone just the holiday season. THAT is worth limiting the treats to just here and there. Please remember that these little ones are kids. Not adults. Party after party, event after event takes its toll on their bodies. In addition to school schedule, packing in a bunch of extra activities at the end of the day can really drain their bodies. If activities after school are a “must”, then it really ought to be made up for on the weekend with naps and early bedtimes. Period. Growing kids need downtime and rest time to recoup. Taxed adrenals from lack of sleep and stimulating parties doesn’t allow the immune system to do its job effectively. Plan in what is absolutely necessary, and really look at what might not be as crucial to have in the schedule. I am a big fan of bone broth or bone broth based soups and gravies daily. Boil rice, noodles, or beans in it if they won’t do soup. Get those babies started early drinking it so they are used to it and won’t bat an eye when given a sippy of bone broth. Ensure they are getting adequate amounts of friendly fats to help their hormones and sugars stabilize. Lots of pastured butter, lard/tallow, coconut oil, etc. Use immune booster smoothies once or twice a week for breakfast. Get some kid friendly soups in the school lunch thermoses. You can still have comfort food dinners in a nourishing way too!Yes there will be the occasional outing to a restaurant or party during this month to celebrate the holiday, but the majority of their diet can still be nutrient dense and nourishing. If you need more ideas for nourishing, nutrient dense real food meals that real families can even make, my cookbook, Nourished Beginnings is packed out with my tried and true, staple real food meals – I still cook out of this book on a weekly basis and my kiddos are big kids now! If the kids end up with a cold or flu, it isn’t the end of the world. All three girls had a pretty decent cold last week, and I look at it as cleaning out the system. It’s when they are getting cold after cold or a bug that just won’t go away after weeks that schedules, routine, and diet could be the culprit. You can still nourish your kids while they are ill and help them recover in a natural way so you can enjoy the rest of the month. I wish you and your sweet babes and healthy and joyous holiday season! One simple, delicious smoothie with a powerful immune boosting punch from elderberries, vitamin C, and gut building probiotics! Very kid friendly in taste too! Product links in this post are affiliate links. It does not cost you anything and helps maintain the free information on this site! Please know I would never personally recommend any product I wouldn’t use on my own family. Please also note that I am not a doctor, nor claim to be one. The recommendations in this post are based on my own research and what has worked really well for keeping my family’s immune system boosted. I am pretty sure every library storytime and preschool drop off we have been to this fall there are one or two kids there with croupy coughs and drippy noses. And in the 2 months since kindergarten started, I have already had reports from my “little momma” that so-and-so was out sick today, emails sent home about pink eye, and on and on. Since I don’t have a newborn this year, I’m still getting the girls out and about, and I’m really not sweating it. I know my kids’ bodies are ready to fight infection, and I don’t want them kept in a bubble. We will, and certainly have, come in contact with cold bugs, and probably even the flu. My goal in the fall and most of the winter is getting immune supporting bone broth in the girls daily. Whether in soups or mugs, bone broth is my weapon of choice to battle bugs. Sometimes, however, I feel we just need a big boost in addition to that. If it has been a long week and I know the girls are tired or run down. If I know there is a cold or flu bug going through the classroom that my daughter spends 7 hours a day in. Or that kid from library time that just loves babies gives her a runny nosed hug. 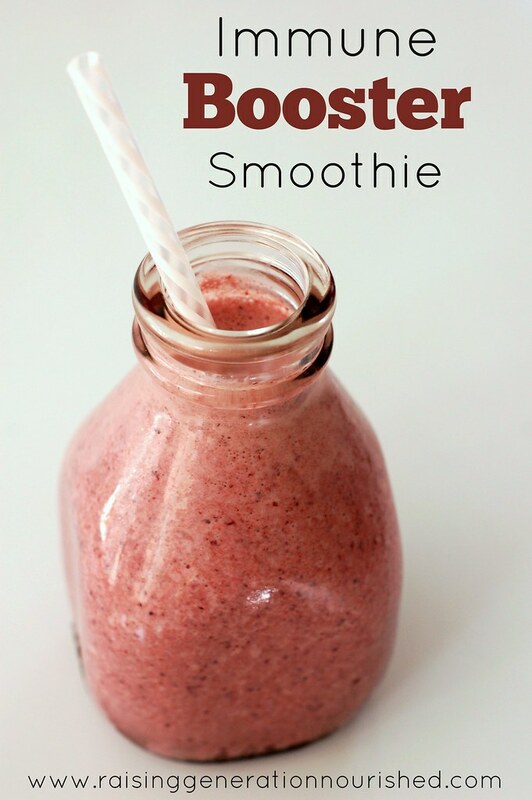 This immune booster smoothie is great for breakfast or lunch. Full of friendly fats from coconut oil and whole raw milk, and filling protein and gut supporting grassfed collagen. 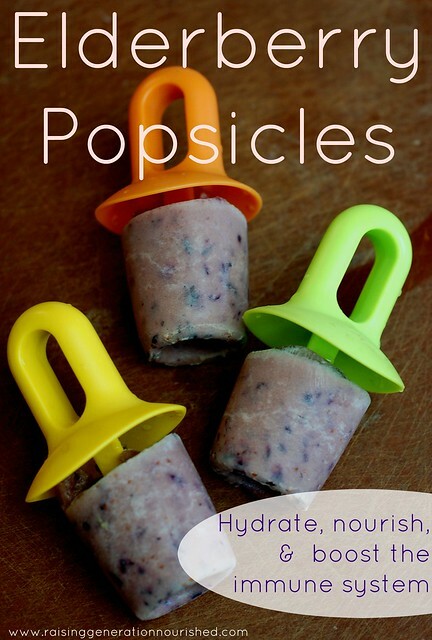 You could also freeze it into popsicles! VITAMIN C: Vitamin C supports the immune system, and when you source it right , it really can enhance your body’s ability to fight infection fast. Please note just simple ascorbic acid is not what we are talking about here. 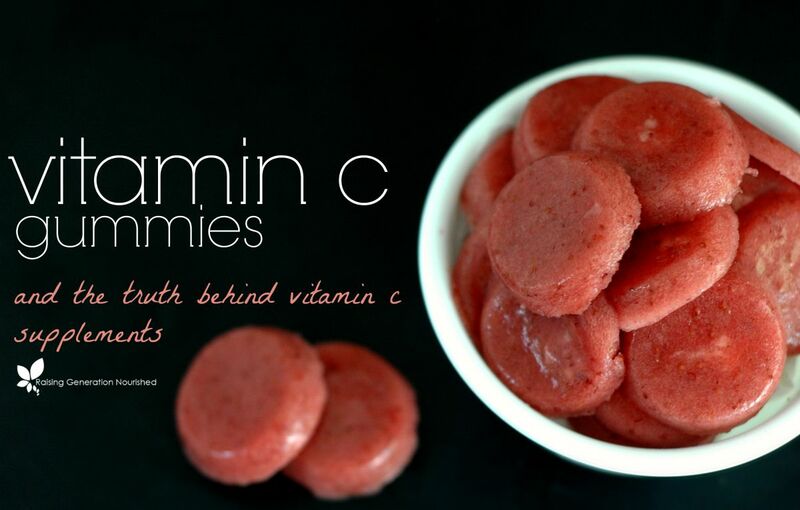 You can read more about why the type of vitamin C you supplement with is so important HERE. PROBIOTICS: Since your immune system resides mostly in the gut, having your good bacteria up to par is very important. There needs to be balance in the bacteria population so I like to rotate our probiotics to introduce new gut flora. I like to start with THIS one, and then rotate with THIS , and then THIS . ELDERBERRY SYRUP: Specifically beneficial in helping support the body during viruses, elderberry syrup is great for colds and flu. It also has a very pleasant taste so it helps sweeten the smoothie. 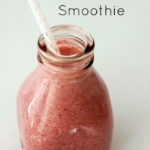 Skip any vitamins the kids might turn their noses up at and make this immune-boosting smoothie. Everything into your blender and blend until smooth. This makes 1 “adult” sized smoothie – my 3 and 5 year olds split one. I have been making a little extra for my 1 year old to have and she has been really liking them. I really love having the cold soluable grassfed collagen around for smoothies. Not only does it give a protein source to smoothies very easily (just dump it in! ), it is also very helpful in restoring gut lining to normal. Add or subtract the supplements as you feel necessary. 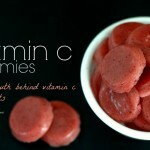 You can read more about the vitamin C I like to use for immune boosting HERE. 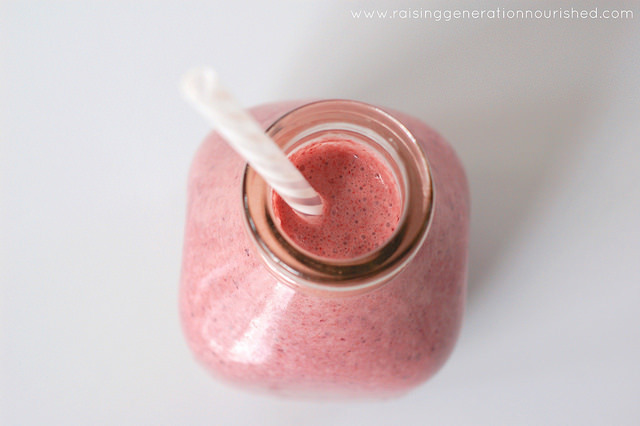 If your kiddo is already feeling ill, you can make the smoothie on the blander side if they are recovering but can still get a small amount of food in. Leave out the milk and use water. Maybe back off on the coconut oil. Maybe add a pinch of sea salt to add some minerals for electrolyte balance. I just use my simple Magic Bullet to blend this all up! This serving fits perfectly! 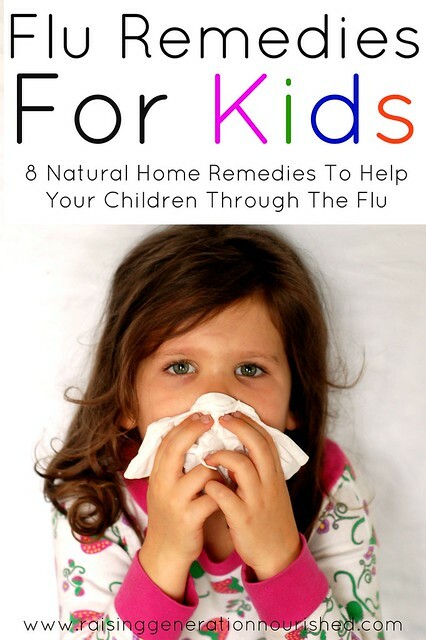 8 natural home remedies you can use right now to help your children through the flu. I’m going to keep it real here, folks. I cannot stand throw up. Just the thought of it makes me want to gag. And then when I start to think about cleaning up throw up from someone else, well, that is enough to send shivers down my spine. Needless to say, I do all I can to make the process as short and as easy as possible for all of us. Yes, there are things you can do to shorten the life of a stomach bug! I’m going to share with you a few of my favorite remedies. Activated Charcoal is something that should always be around your house. Not only is effective at helping with a stomach bug (both ends) it also works for food poising or if you accidentally get glutened. It works by binding with the ick that is going around your digestive track and helping pass it. Make sure your child is also getting plenty to drink to make sure things are passing through their system. Charcoal is messy so I use caps as soon as my kids are able to swallow them. If not, I mix the charcoal in some applesauce or yogurt. According to the Mayo Clinic, for children less than one you can dose .23-.50 grams of charcoal per pound of body weight. I tend to start with lower doses. I dose after the child has had an episode of diarrhea or vomiting. The syrup from canned peaches not only tastes good for those with icky tummies but it also helps stop diarrhea. I like to water it down and make it in to popsicle. Popsicles seem to be an easy way to keep up fluids when the kids are sick. Cell salts are remedies that help the body use the minerals that are already present in the body. What I have found in particular with stomach bugs is that they help keep the minerals balanced and help prevent dehydration. 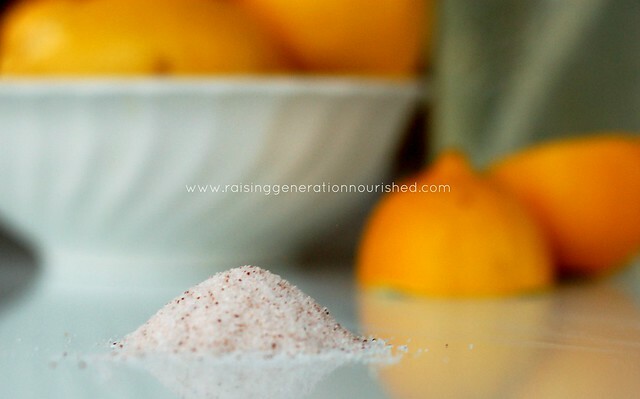 Epsom salts or Magnesium flakes are a great addition to a bath any time the kids are sick. Magnesium helps the body detox and reduces muscle aches that are common with colds and the flu. (They also help soothe sore behinds when diarrhea is an issue). Baths aid in hydration as well. Slippery Elm is a great, gentle herb that does a bang up job of helping to soothe an inflamed digestive tract. Slippery elm contains large amounts of tannis which is an astringent so it can help ‘dry up’ diarrhea. Keeping the gut full of probioitcs is going to help lessen the severity of a stomach bug. Yogurt, kefir, beet kvass, and kombucha are great because small amounts contain loads of good bacteria. Quality gelatin is also good for the gut and homemade gummies and jello can help sooth an upset stomach as well as provide nutrients. 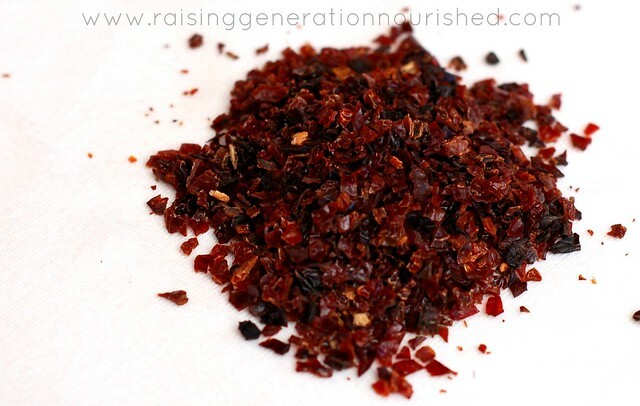 You can also add anti viral herbs like elderberry to your gummies like in this recipe. 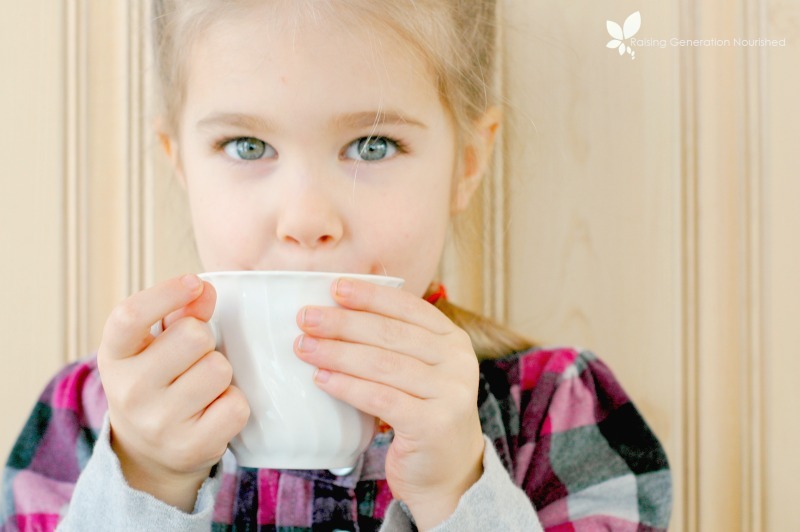 If you can get one thing in your child’s system while sick, it should be bone broth. This is a rock star because it will help with hydration, provide minerals and nutrition and is very healing. 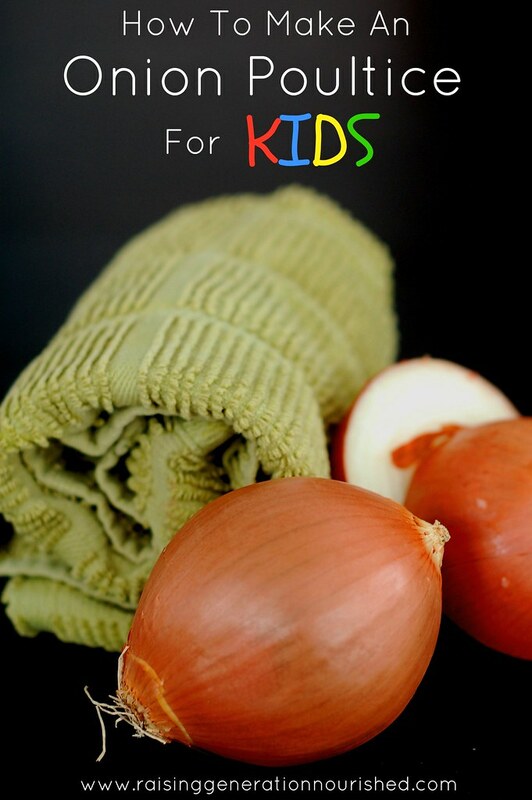 Renee has some great posts on how to make stock and many soups that are kid friendly. 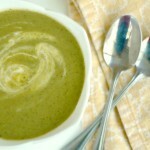 (Click HERE and look under “lunches” and you will find many simple soup purees to try!). There are also some fantastic soothing and nourishing food staples that can be helpful as children work back to eating after active throwing up and/or diarrhea. You can find those HERE. I am a big fan of Plant Therapy’s KidSafe “Tummy All Better” synergy for tummy aches – the oils chosen for this blend were specifically chosen to be safe for kids as well as effective. You can get a ready made roller bottle which is really nice for those middle of the night tummy aches! It is diluted perfectly for you and you can just roll it right on their tummy. They also have it in a undiluted essential oil bottle you can dilute yourself. If you have older kids, another option would be diluting peppermint oil down in a carrier oil, and rubbing it on the feet and stomach. If your child is sensitive to smells, don’t force this one on them. I find it is very individual. Fevers feel scary to most moms, but know that they do have a job to do. I like to support the body while a fever is going on and luke-warm epsom salts baths are great for that. There are some herbs that work fantastic for fever. Here is where you can read more about very simple methods for how to use yarrow and elderberry for fever. Gently bringing the fevers down without causing the body to be overloaded are key. 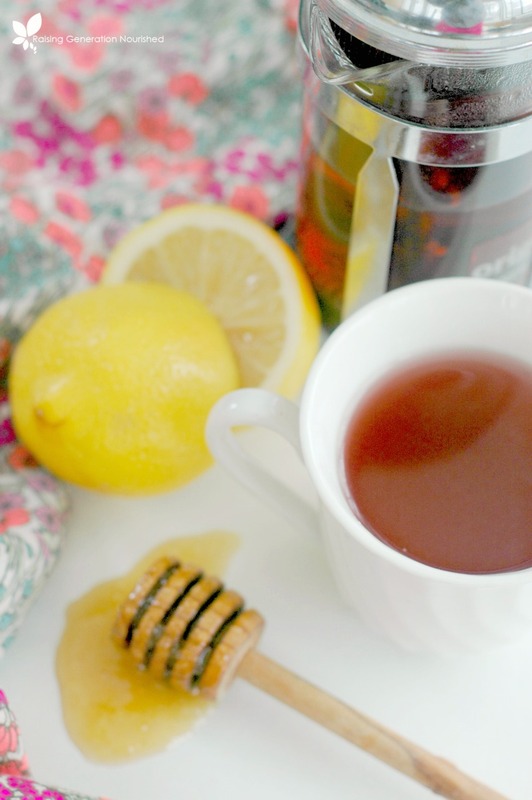 If you have chest congestion going on, you can find my favorite ways to deal with it, HERE. While there are many, many more herbs and supplements to help stomach bugs, these are my tried and true ones that I pull out for my kids. I have been able to keep a stomach bug from being passed around the family and lessen the severity of it with the above remedies. If you are interested in more home remedies, you can check out this page on my blog, HERE. I’d love to hear from you, tell me what are your favorite home remedies for stomach bugs are? 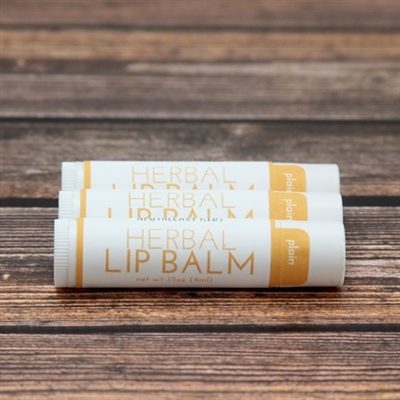 Jessica loves to learn and share about natural living, from whole foods to herbal remedies. With a desire to take care of her family through natural means, she has spent a lot of time researching and experimenting to find what fits best in her lifestyle. Struggling with her health for a few years after a miscarriage she tested positive for Hashimoto’s and is currently working on healing through diet and natural supplements. Jessica started her blog Simply Healthy Home to share her family’s journey to being healthy and happy. You can follow Jessica on Facebook and Pinterest. This post was shared at Fat Tuesday, & Real Food Wednesday! 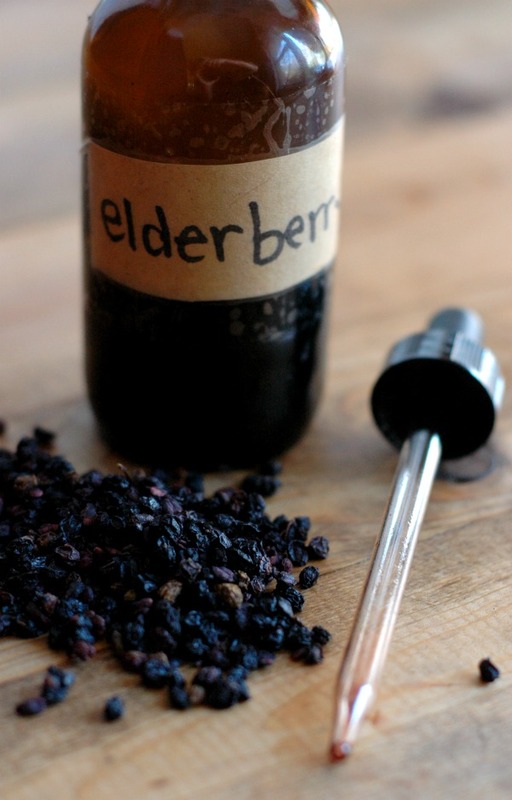 Known for it’s virus fighting capabilities, elderberry syrup packs a powerful punch to the cold and flu! And it is so easy to make your own! 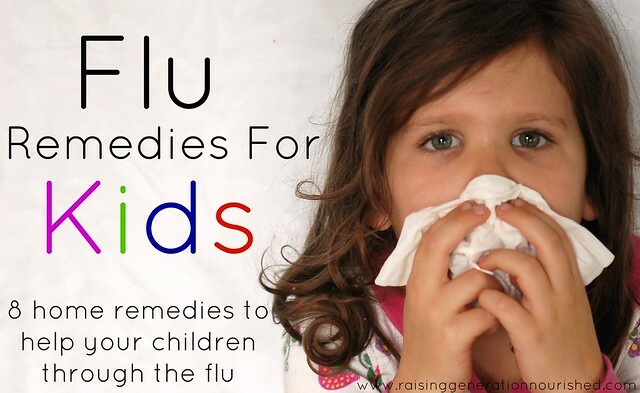 Cold and flu season is right around the corner! Well, not exactly, but it is a great idea to be prepared ahead of time so you know what to do if and when a virus does attack your house. I wasn’t actually planning on posting elderberry syrup for at least another month, but as it happens, there is a local outbreak of the hand, foot, and mouth virus in our area pretty bad. I wanted to give my girls’ immune systems a bit of an upper hand against it in case it happened to spread to us, so we have been enjoying plenty of bone broth based soups, making sure we stick to bedtimes for our rest, taking our probiotics , and I also made up some of this elderberry syrup. No one likes their kids to be sick, but I’ll be honest, I really don’t fret about it. I don’t intend on keeping my kids in a bubble, so it is inevitable that they will come in contact with bugs. But that doesn’t mean they have to be out for the count for days on end. Giving their bodies the tools they need to have immune systems that operate effectively is key, and if it just so happens that a virus doesn’t get swept up right away, there are natural ways to put up a good fight so they can be back to playing again soon. Elderberries are well known for specifically being very powerful against viruses. Elderberries work well at giving the immune system a boost to fight off the flu faster and more efficient. You can find elderberry syrups and even tinctures lining the shelves of most health food stores, and even some conventional grocery stores. I have always been a bit leery of the shelf life on the syrups specifically, along with the other ingredients that usually end up on the list. Not to mention the sticker shock at some of them! 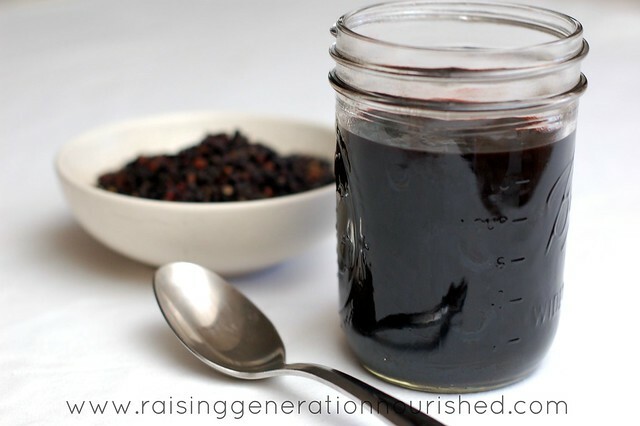 I like adding rose hips to the simmering pot of elderberries since they are a good source of immune supporting vitamin C. It has a very pleasant, kid friendly taste as well so it works well in this syrup. 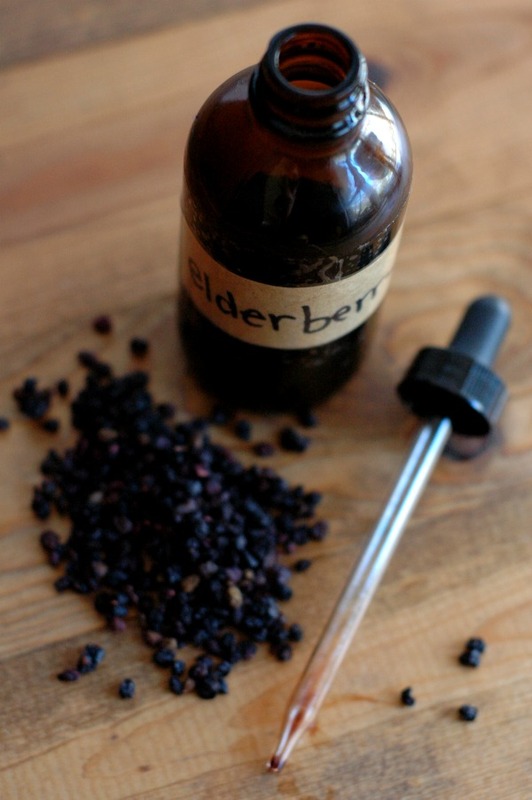 Making your own elderberry syrup is not only super simple, but it doesn’t take a lot of time. I like knowing exactly what is in the syrup, and knowing where my berries are sourced from. I have been making elderberry syrup for years, and despite germy preschool rooms, green snot nose library times, and multiple family get togethers over the holiday season, and sort of bug we encounter is very short lived from 24 to 48 hours. It is not solely based on the elderberry syrup, but I do think it gives them an upper hand. As you can imagine my number one priority is always nutrient dense food so their bodies can function well in the first place. It is a great idea to be prepared ahead of time so you know what to do if and when a virus does attack your house. ¼ cup or more to taste raw honey optional – if you plan to give this to your one year old leave this out as raw honey is not recommended until they turn 2. Your "syrup" will be a little runnier but you will still have the benefit of the elderberries. 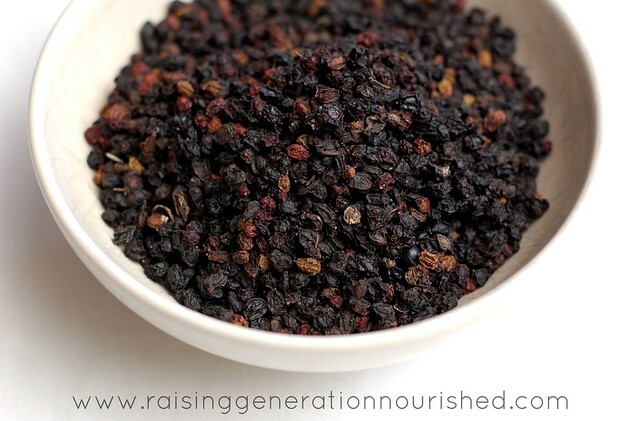 Put the elderberries, optional rosehips, and water in a small pot and bring to a boil. Reduce to a low simmer for 45 minutes WITHOUT a lid. Turn the heat off and mash up the elderberries and rosehips with a potato masher. Strain out the elderberries and rosehips and give them a good squeeze to get all the liquid out. Either strain in a tea towel and squeeze, or a mesh strainer and use a spoon to squish them down. A French press works well too. Store the syrup in a pint mason jar in the fridge for 3 months. Doseage while ill is 1 tsp hourly for children, or 1 TB for adults. When we are not ill, but it is during the cold and flu season and we may have been around some virus/flu, I will give 1 tsp daily for a week to the kids, and 1 TB daily for a week for my husband and I for preventative measures. I actually prefer to use my French press to strain out the syrup. I use it to make herbal infusions/teas, and of course coffee too. Here are my tips on serving it to the kids! I use a medicine syringe because the syrup stains. They do take it off a spoon no problem but I just have accidently dripped too many times and ruined shirts! 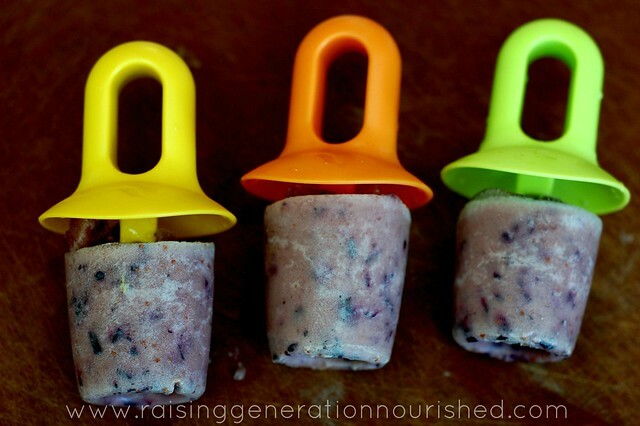 It is also delicious stirred into soaked oatmeal with berries, smoothies, popsicles, or whole plain yogurt! Here is a trustworthy source for your elderberries and rose hips if you don’t have them locally foraged. Here is a recipe for nourishing cold bug fighting bone broth to help your family through an illness. Slow cooker method too! Other things I like to use during illess is this properly sourced vitamin C . I do also use this vitamin D3 liquid daily even when not ill. Fermented cod liver oil is the best source for vitamin D, however some in my family do not tolerate it well, so I have the vitamin D dropper on hand. I have brought my D levels from in the low 20’s to well above 60 using the liquid D3 in the last year. Living in an area where we only see the sunshine 6 months out of the year, we really need to supplement vitamin D in our family if we want immune systems that function well. And since most of our immune system is in our gut, making sure we are eating fermented foods is important to ensure health gut flora. I also like to rotate probiotic supplements especially during the cold and flu season. Rotating helps introduce new flora. Here , here , and here , are the probiotics I like to use. This post was shared at Fat Tuesday, and The Homestead Barnhop!